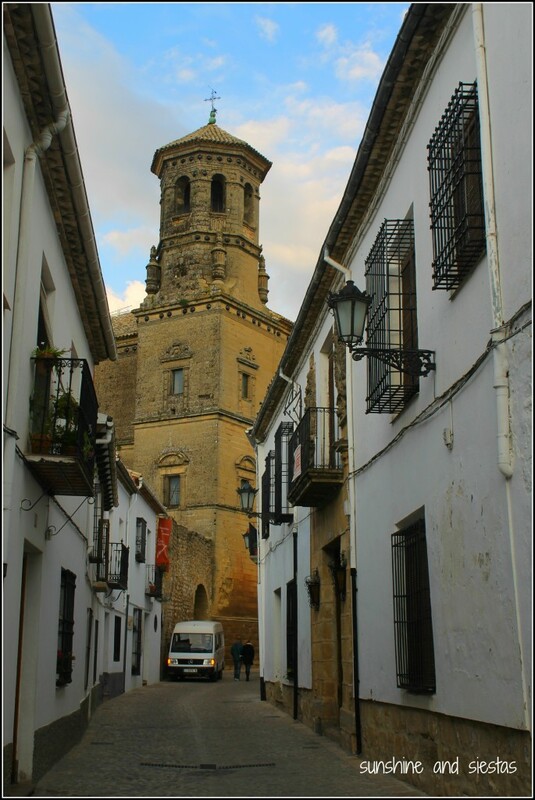 For whatever reason, the province of Jaén has always piqued my interest – and has always intimidated me. I considered it No Man’s Land because of my extreme allergy to olive blossoms, too far from Seville to merit a day or even an overnight. And with a move to Madrid looming, I would find the province even further away, despite being geographically closer to the capital than Sevilla. But I’m the now or never kind. After blowing out my eardrums attending Las Fallas in Valencia before chasing Don Quijote’s windmills (and chasing them down with a glass of wine in Valdepeñas), I decided to stop for a night in the UNESCO World Heritage towns of Úbeda and Baeza to avoid the Holy Week processions in Seville. 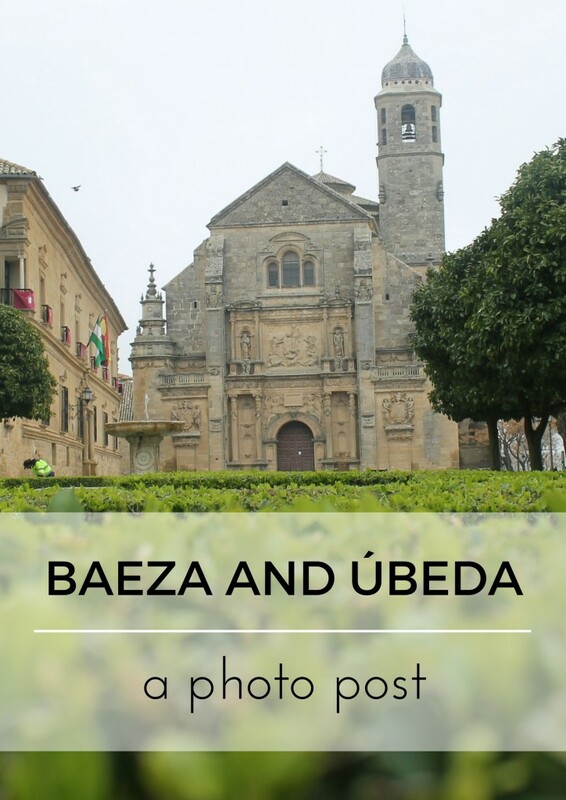 The pueblos gemelos of Úbeda and Baeza are nestled into rolling olive groves and noted for their Renaissance architecture, and they’d been on my Spain wish list for years. I called the Novio to tell him not to expect me until Tuesday evening, as I was adding two more pit stops to my trip. 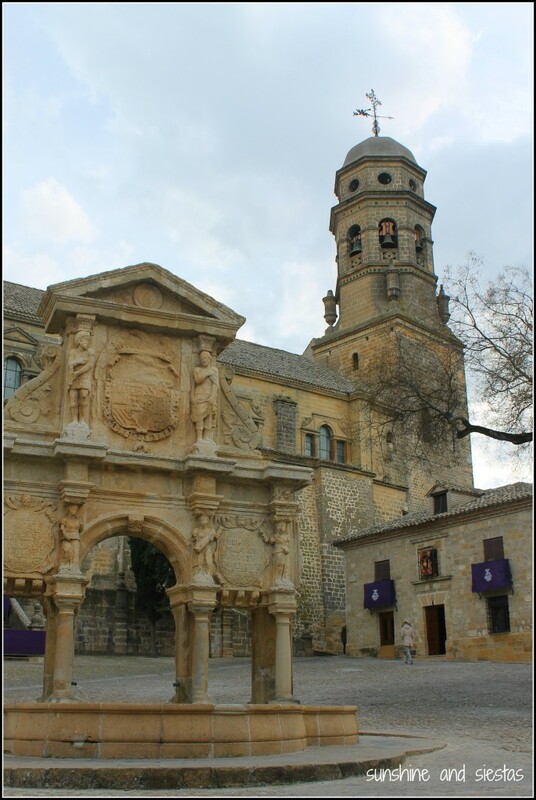 Nearby Úbeda gets a lot of the attention, but Baeza is superbly conserved, boasts a strategic position over the fertile Guadalquivir valley and has an astonishingly high number of intellectual former inhabitants – including poet Antonion Machado – thanks to its university and Guardia Civil academy. But it was the cheap, last-minute hotel deal that got me. Sin rumbo, I set off from the hotel towards the city center, itself a labrinyth surrounding the cathedral, old university and the ruins of an impenetrable fortress. 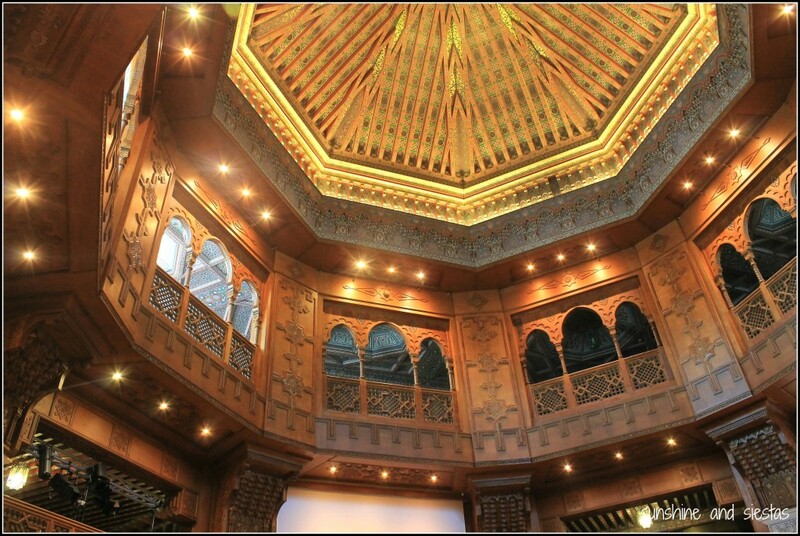 Machado himself called it the Salamanca andaluza for its appearance and intellect. The wind howled through the tangle of streets and my eyes watered from the stinging chill and the olive trees growing heavy with blossoms. 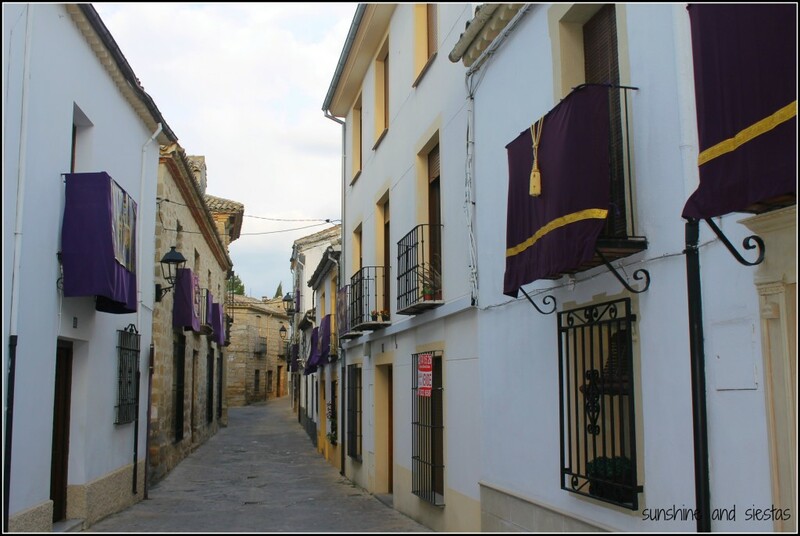 Baeza was a town that I’d normally describe as the Spanish type of sleepy, a town in permanent suspended activity. 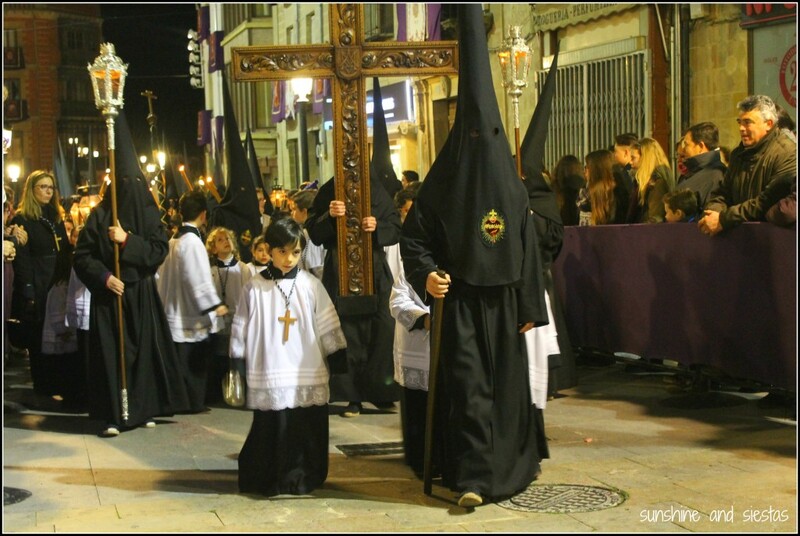 But being Semana Santa, I arrived mid-afternoon to a town too excited to sleep a siesta. 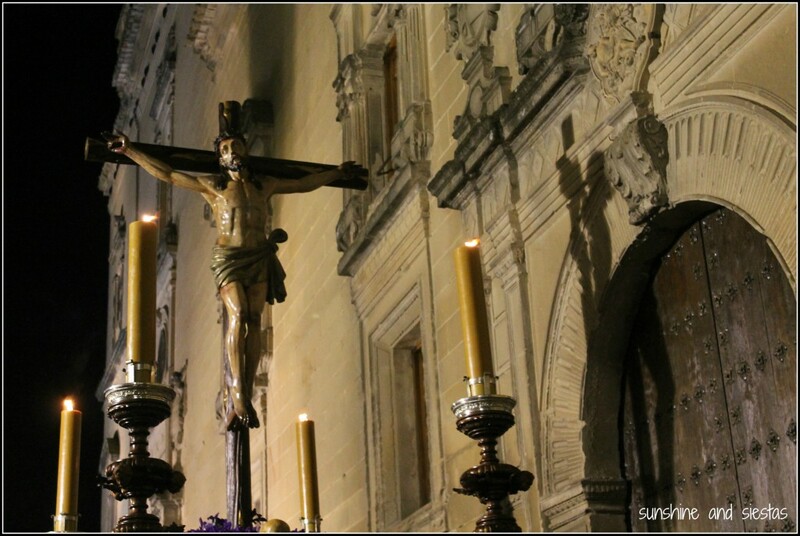 La Misericordia – Baeza’s answer to Seville’s somber Madrugá processions – would step off that night from the school where hijo predilecto andaluz Machado once taught French grammar. This small city once housed a booming textile industry and takes pride in its Italian Renaissance architecture. 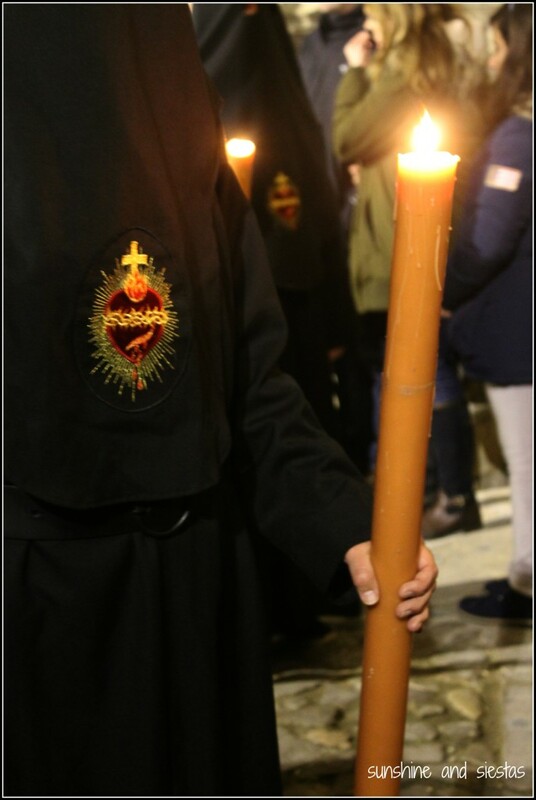 It felt like I had the village to myself, everyone squirreled away around their braseros (nosy me peeked into ground floor windows) or preparing floats for the Holy Week processions. 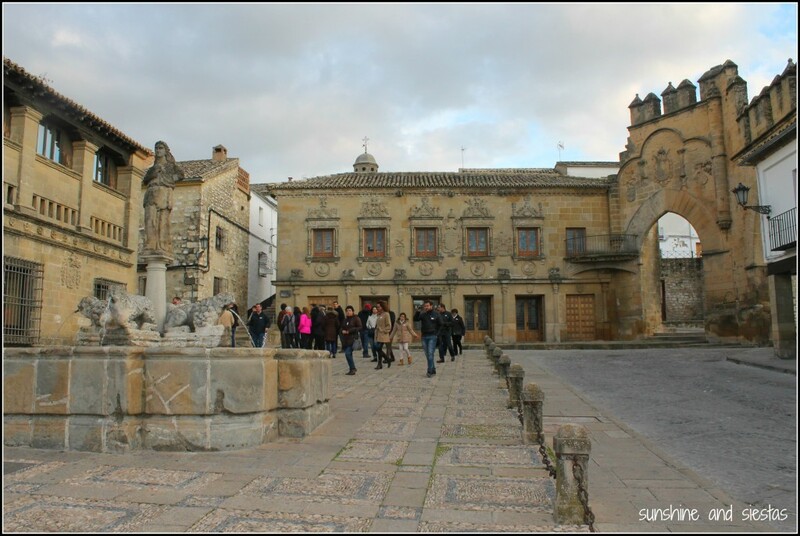 Even a group walking tour I ran into in the charming Plaza del Pópulo was sadly thin. 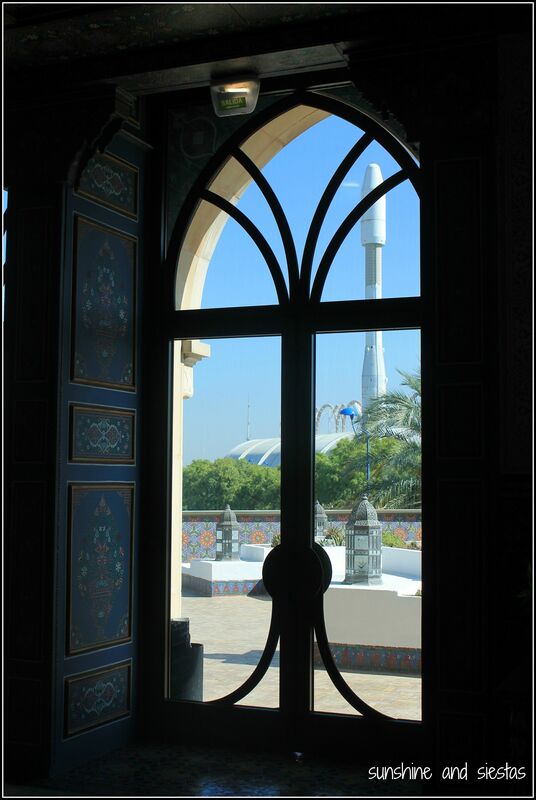 I wandered around the entire historic center and past its most emblematic buildings, haunting and silent sentries. My phone nearly dead and a chill in the air, I treated myself to a long rest before heading back out at twilight. Plaza de la Constitution’s colonnades hid intimate tapas bars with low lights and the smell of olive oil wafting out of them. 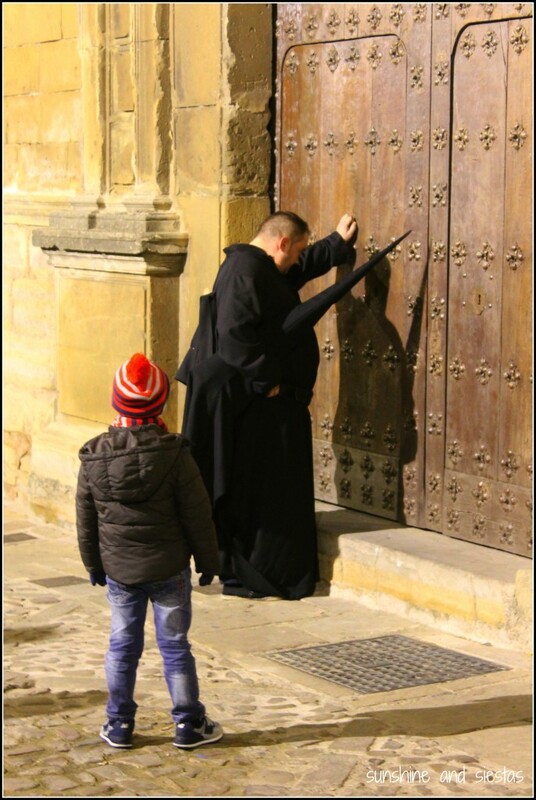 The lights glinted off of religious medals, worn by the faithful who would no doubt be elbowing me through the narrow streets to see La Misericordia. As I was mopping up the last bit of oil with a piece of bread, the restaurant suddenly thinned out. I threw some money onto the bar and rushed outside. 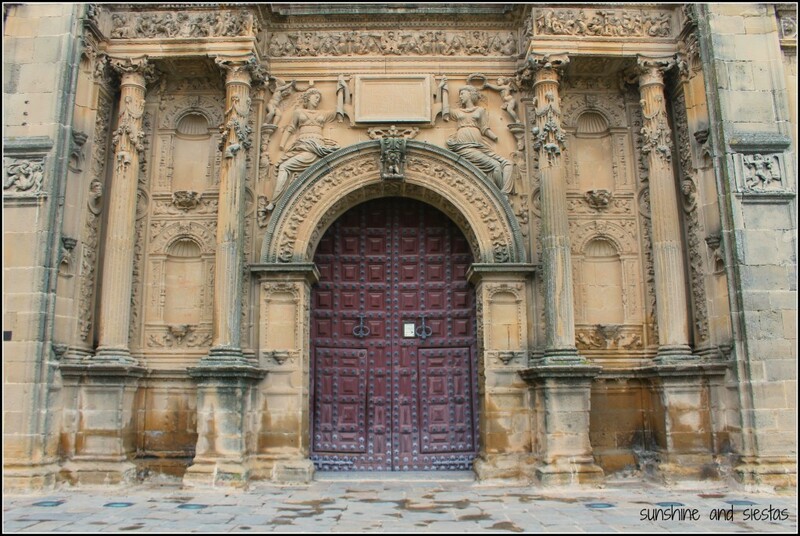 Across the plaza and up a small hill was the university’s heavy wooden doors. Darkness had fallen, but the golden light spilling out from windows proved that Lunes Santo was the big night for baezanos. Paso de pasos during Seville’s Holy Week, but there’s something intimate and primitive about processions in smaller cities. They tend to be more somber, as if carrying the images of Christ’s last days is for the more fervent, that it’s less about spectacle and more about spirit. 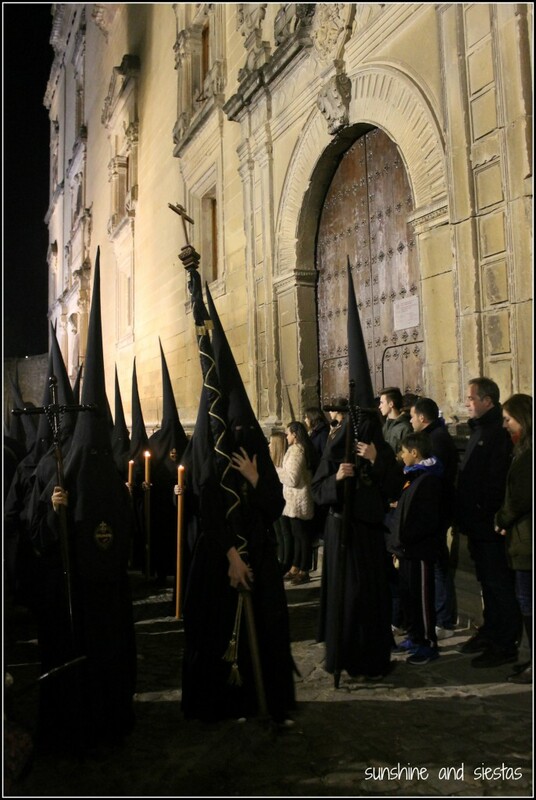 Indeed, Baeza and Úbeda’s adherence to Catholic tradition isn’t as grandiose as Seville or Valladolid’s, but I saw passion as I watched the nazarenos shuffle by under heavy black capirotes. As they snaked through the Casco Antiguo and followed the trail of the old city walls, I hunkered towards my hotel, catching glimpse of the procession and literally fell into my bed. 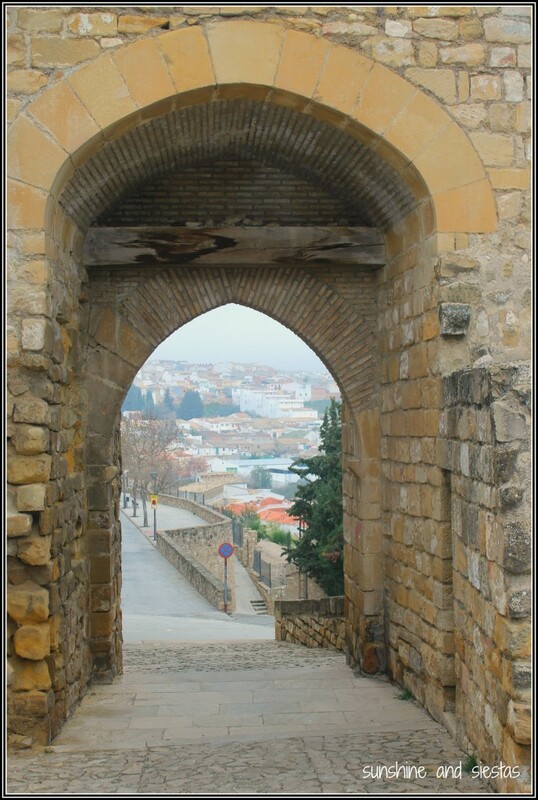 A thick fog covering the ribbon of road between the sister cities the following morning, I steered Pequeño Monty toward Úbeda. 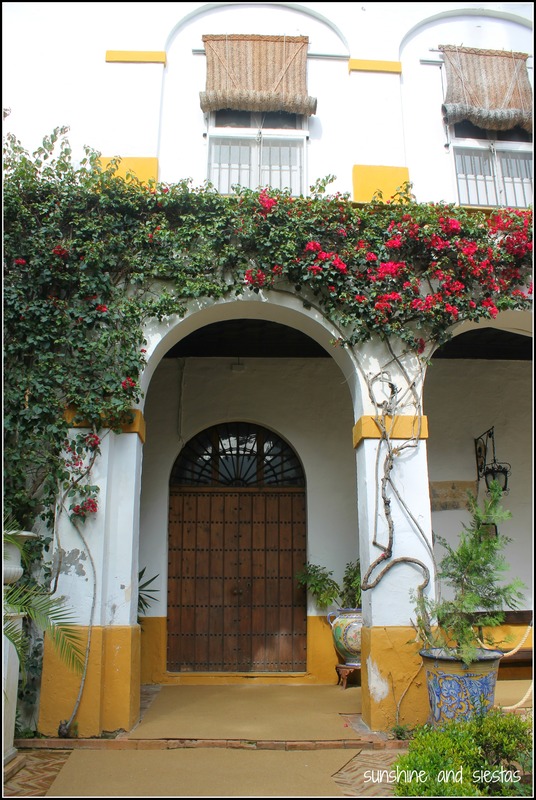 This is where fellow blogger Trevor Huxham lived as an auxiliar de conversación for a year, and he was quick to fire off a food recommendation: churros at Cafetería Anpa. The cold was permeating, so I treated myself to a thick mug of chocolate and a ración of churros. You know, a good old stick-to-your-bones sort of breakfast. Fog still sat over the Lomo de Úbeda as I wandered towards the city center, and for 9am on a Tuesday, even quieter than Baeza. The cobblestone sloped downwards towards the sandstone monuments that scored it its UNESCO designation, all locked up and shuttered up as if warding off the chill in the air. I pulled my jacket around me tighter, realizing that I’d not dressed properly for the cold morning. 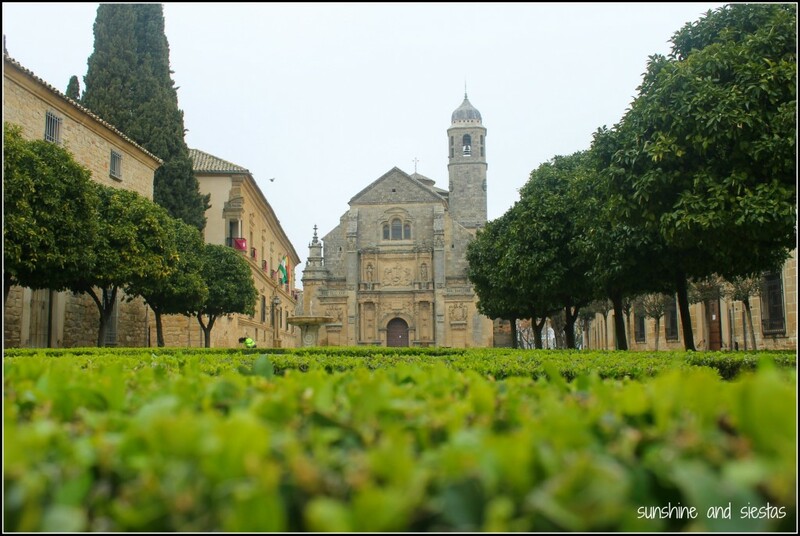 The jewel in Úbeda’s well-earned crown is Plaza Vázquez de Molina, flanked by half a dozen buildings built in the Italian Rennaissance style: the Sacra Capilla del Salvador, the Capilla de Santa María de los Alcázares and the Palacio de las Cadenas are perhaps the most famous. I wandered into the nearby Parador for a coffee and to warm up a bit, but instead was met with sniffles, sneezes and itchy eyes. As I feared, my allergies betrayed me in Jaén. 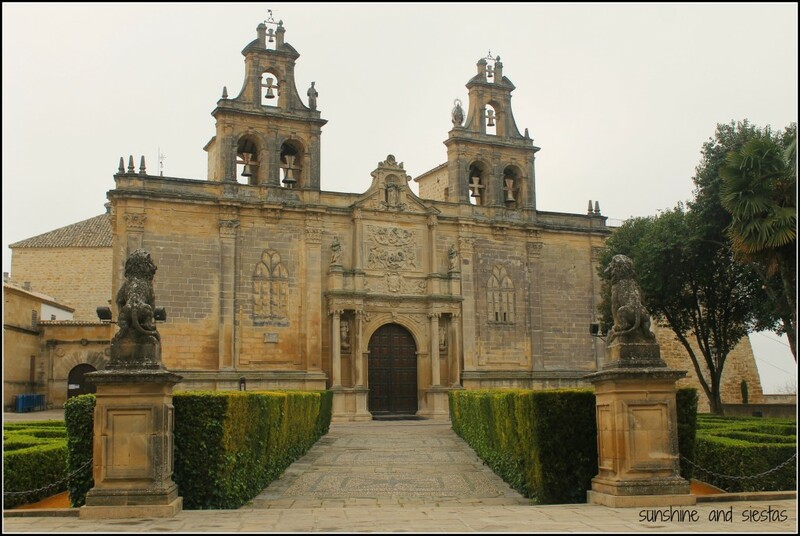 Úbeda merits far more than an hour I spent with my nose in a Kleenex – if not for the architecture than for the historical privilege brindado to this beautiful place. Like Machado’s exile from Spain during the Civil War and his absolute heartbreak over the Republic, I got in my car and found myself suddenly questioning our move to Madrid. Andalucía is, for me, home. The rolling olive groves fanned out from Jaén through Málaga and on towards Sevilla gave me some comfort on the three hour trip, and now – 16 months after this little jaunt – it’s a view I miss when driving through Madrid’s urban sprawl. In fact, it washes me in relief when the high speed train passes through Despeñaperros and spits you out in the Jaén province. Late, corazón…no todo se ha tragado la tierra. If you’re in Úbeda for breakfast, do not, pero DO NOT miss the thick chocolate and crispy churros at ANPA. Corredura San Fernando, 33. 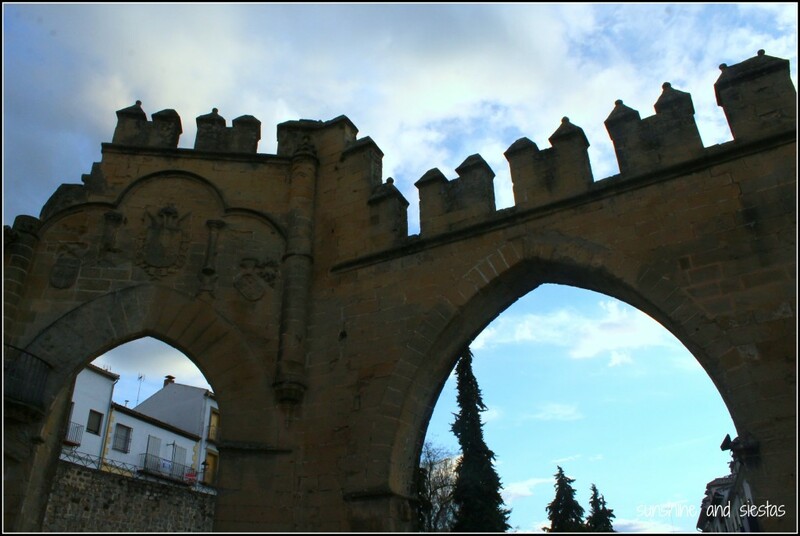 Do: In Baeza, climb the torreón at the Puerta de Baeza for views (and cheesy medieval stuff) after wandering around. 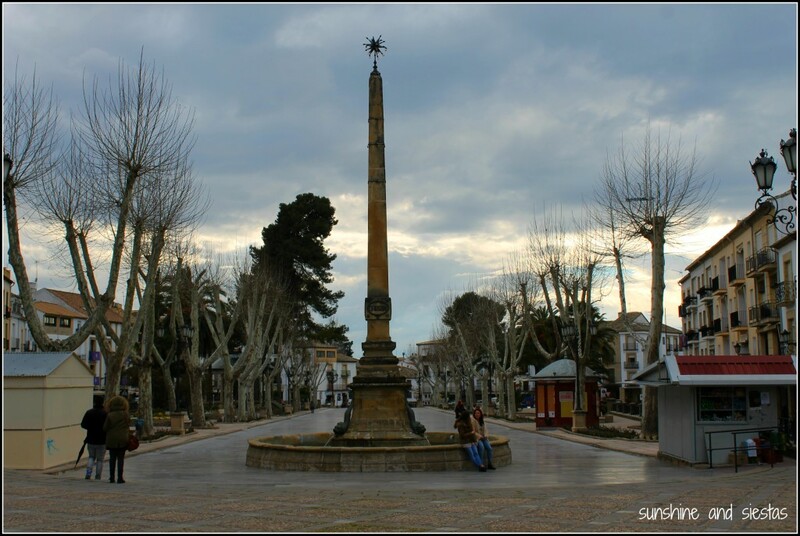 In Úbeda, you can’t miss the Plaza Vázquez de Molina – and do get into the buildings if you can. Had I more time, I would have taken a guided walking tour. 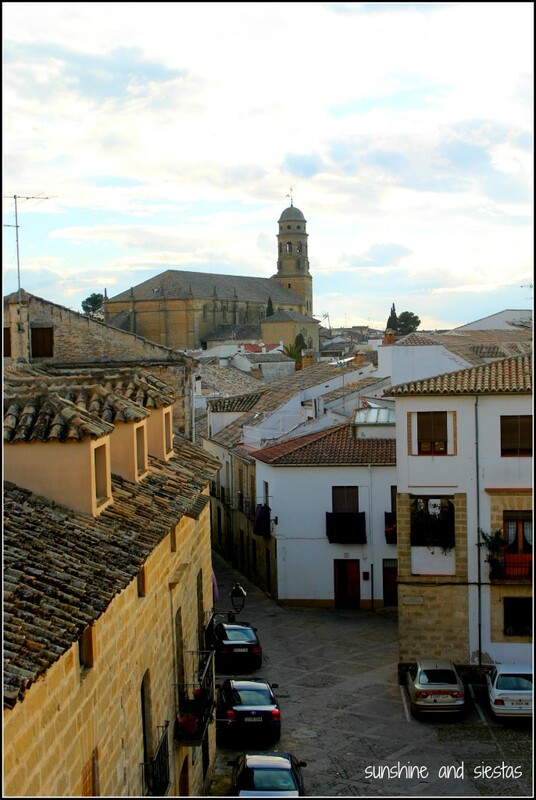 Have you ever been to the Jaén province? There’s more to Ibiza than Pacha, the jet set or kitesurfing. Dalt Vila, meaning ‘Upper Town’, is a significant fortified acropolis that has retained all of its charm; in fact, it is one of the most picturesque old towns in Spain. The winding, narrow and steep cobbled streets, the vast terraces and the high ramparts all exude wonder, magic and a colorful history. Listed as a World Heritage Site, UNESCO describes Ibiza’s old town as exceptionally well preserved and note the evident historical imprints of the Renaissance, the Catalans, Arabs and Phoenicians. 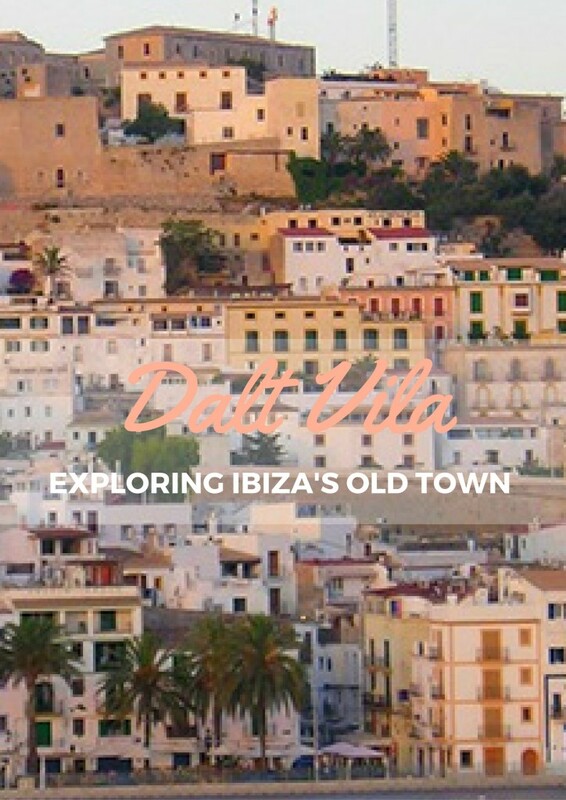 Dalt Vila is a sublime place to visit for lovers of history and culture. Join me as we explore the wonders of this magical town on this popular island. With a history that dates back to the 13th Century stretching through to its gothic refurbishment in the 18th Century, the cathedral of Dalt Vila is a central attraction of the town – one you certainly do not want to miss. Sitting at the top of the acropolis, it offers tremendous panoramic views of Ibiza. The beautiful cathedral also holds several significant pieces of art. This museum is also one for the art lovers and is home to a number of works by Ibizan artists, such as Narcis Puget Vina and his son, Narcis Puget Riquer. The Puget Museum hosts temporary exhibitions, too, so it is always worth having a look in advance at the artwork they will be displaying. This massive necropolis houses over 3,000 tombs that date back to the Phoenician era and the era of the Punics (Carthaginians). 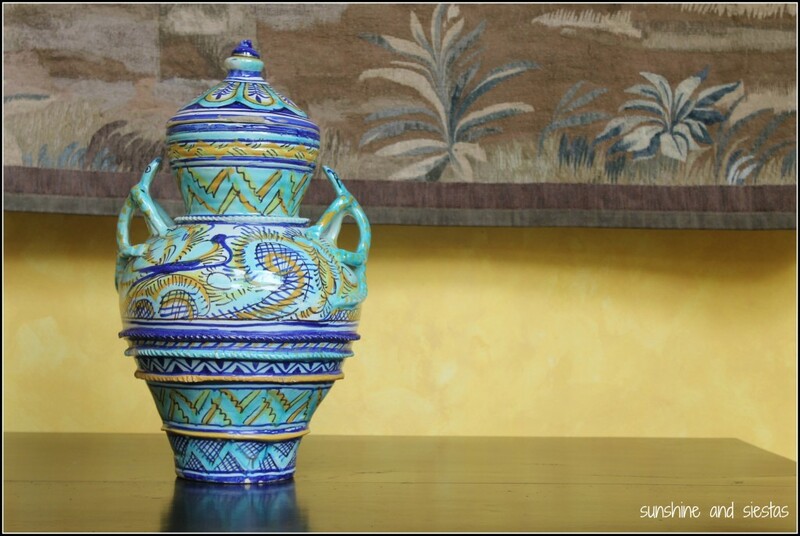 Exhibited in the Monographic Puig des Molins Museum, the magnificence of this archaeological find is only bettered by the tremendous collection housed at the museum – a collection consisting of the Phoenician, Punic and Roman artifacts found in Ibiza. 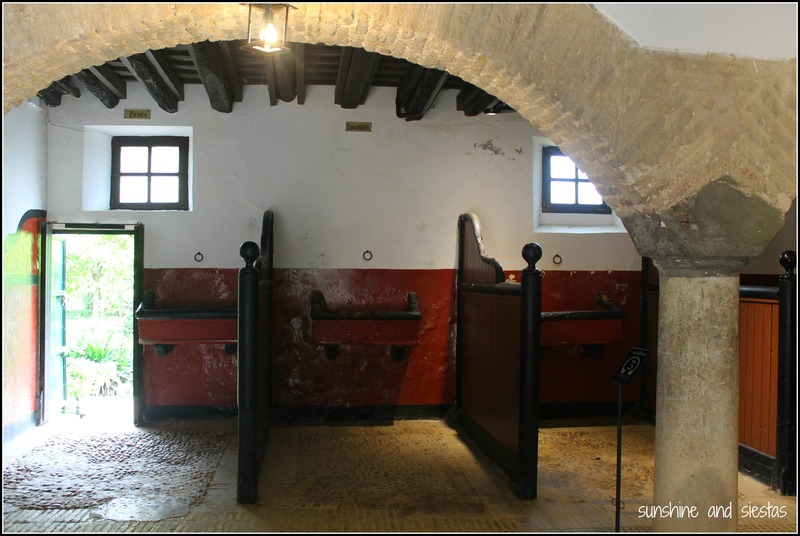 It is here that you will discover the depth of Dalt Vila’s history. 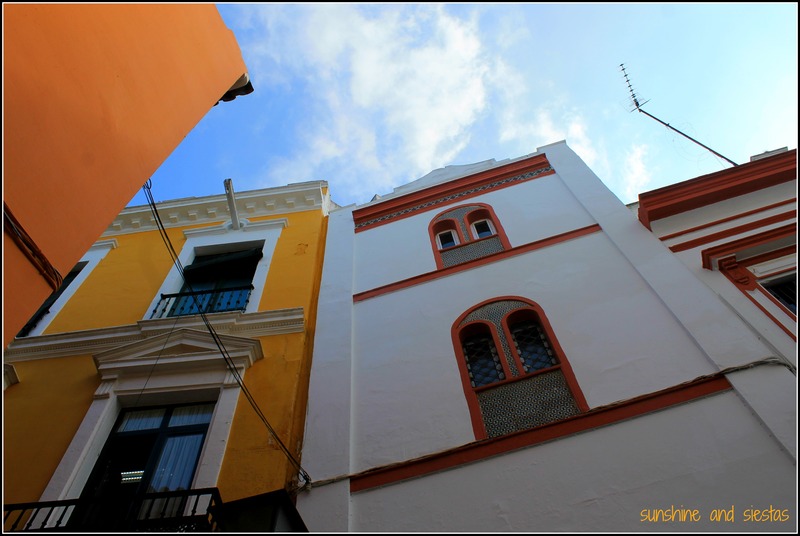 These two resorts are great places to utilize as a base to explore Dalt Vila. Es Caná is a relatively small resort that is relaxed and friendly but with a lively air thanks to the popular weekly Hippy Market. Santa Eulalia, on the other hand, is a quieter destination popular with families and gastronomes, what with its long-established reputation as the culinary centre of the island. Both have golden beaches to enjoy as well. Talking of fine dining, eating in Dalt Vila is also an easy affair with a plethora of fine restaurants to choose from. The dishes to try are the two delicious traditional specialties: guisat de peix, which is a fish stew, and peix sec, which is dried fish. There are even more wonders to discover in Dalt Vila, this brief guide does not even scratch the surface of the treasures that await you. From the awe-inspiring castle that stands on top of the acropolis, to the sixteenth century fortified walls that embrace the unique architecture, to the monumental Sacred Heart of Jesus, to the many nearby beaches, Ibiza’s old town is a richly rewarding experience. Just remember to take a comfy pair of shoes, for the simple pleasure of a romantic walk with stunning views is what Dalt Vila does best. Ibiza and the Islands are on my short list for next year – though partying with a newborn is not happening. Any great tips for food, sites or excursions? Just like on the day of her death, my phone started pinging with the news that the Duquesa de Alba’s beloved palace, Palacio de las Dueñas, would be converted into a public museum. Sleep still crusting my eyes from a Friday afternoon siesta, I search for a projected opening date, scrawled “PALACIO DUEÑAS TIX” on an open page of my agenda, and rolled back to sleep. 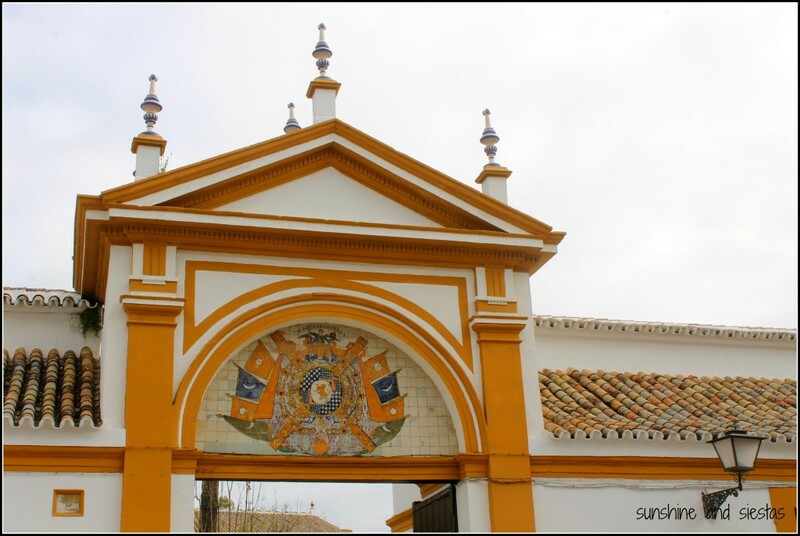 Several weeks later, under a post-Feria chill and dreary skies, I did a personal pilgrimage to honor Doña Cayetana de Alba, stopping at three of her favorite places – the brotherhood of Los Gitanos, Palacio de las Dueñas and Bar Dueñas. Born to an aristocratic family in Madrid before the outbreak of the Spanish Civil War, María del Rosario Cayetana Fitz-James Stuart (and that’s just the short version of her 26 names) lived her life in constant fear of being alone, bounced between London and the Spanish capital. Despite being gifted in arts and horsemanship and considered one of Span’s most beautiful young women, she only truly felt fulfilled when she was visiting her Tía Sol in Andalucía, according to her autobigraphy Yo, Cayetana. 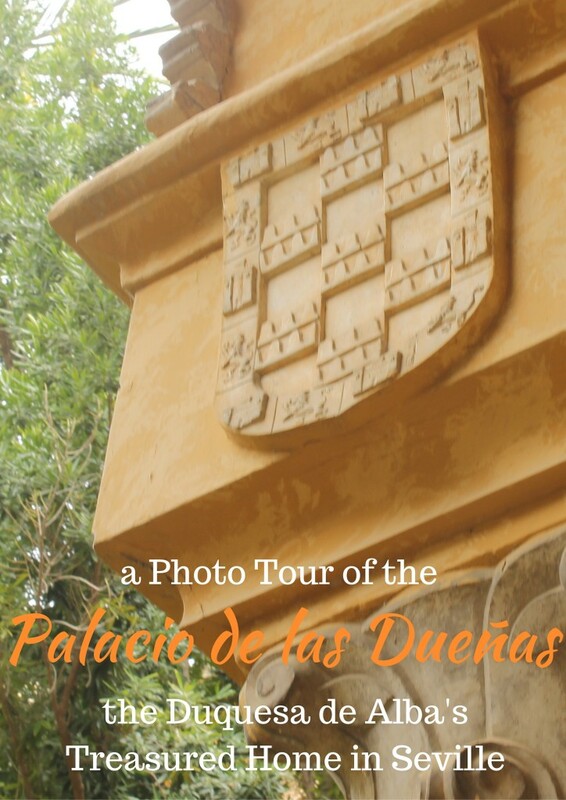 And it was here at Palacio de las Dueñas, a 15th Century state home situated in the heart of Seville, where she’d marry her third husband, live out the happiest of her days surrounded by art and bubbling fountains, and where she’d return to die. I began first at her final resting place, the Templo de Nuestro Padre Jesús de la Salud y Nuestra Señora de las Angustias Coronadas (locals call it Los Gitanos for the religious brotherhood that does it penitence during the Madrugá). In a humble tomb decorated with dried flowers rests the hermandad’s gran anfitriona, a large marble plaque marking her final wish to be buried near the altar. Cayetana was a people’s princess of sorts, and her devotion to the brotherhood and fervent faith was as as strong as her love of horses, bullfighting and flamenco. I wandered the backstreets of a neighborhood I don’t know very well, close to Los Jardínes del Valle, to kill time. Cayetana was often seen out walking, not afraid to be hounded by paparazzi or approached by sevillanos. The only time I ever saw her, she was chattering away in a horse carriage at the fairgrounds, as if she were just another well-to-do sevillana (or at least one of those who took out a loan to guardar aperiencias and pay for the new traje de gitana). 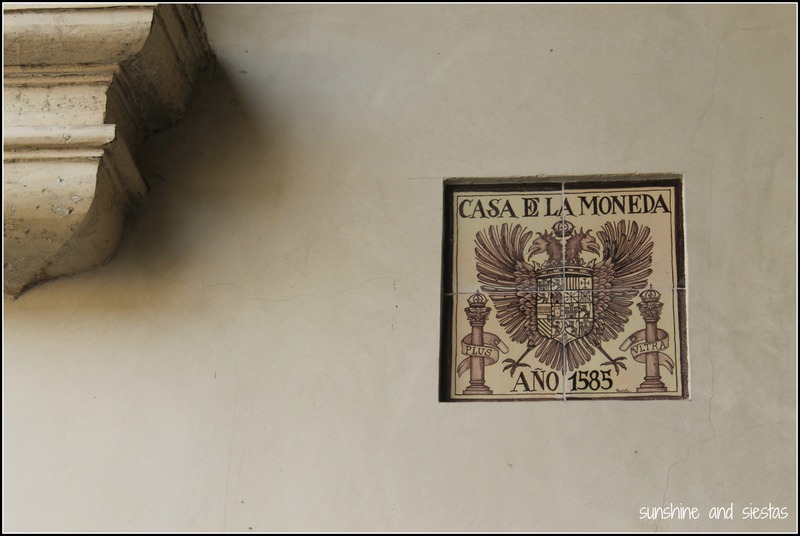 Through marriages and kingdoms uniting over six centuries, the Casa de Alba became one of the most prominent aristocratic families in Spain. 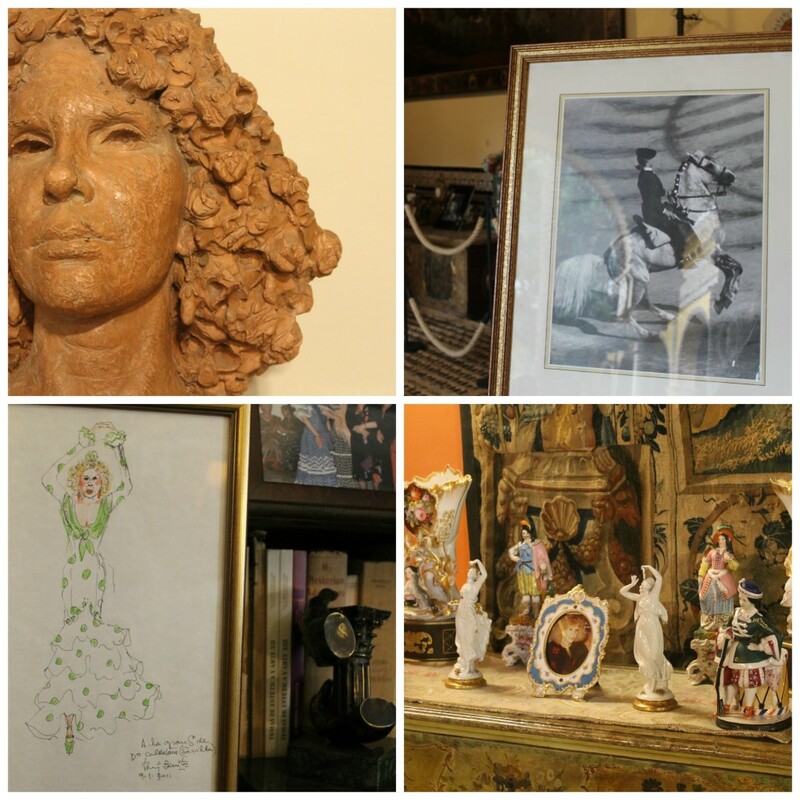 By the time Cayetana was born in 1926, the family had amassed over a dozen properties, countless works of art and handicrafts and a name that made anyone either roll their eyes at their immense wealth or sigh in wonder. Palacio de las Dueñas, named for a monastery that once stood on the grounds, was a place I had to visit before leaving Seville. When my friend Claudia lived next door, I’d often crane my neck over her fourth-floor balcony to see into the palace walls. 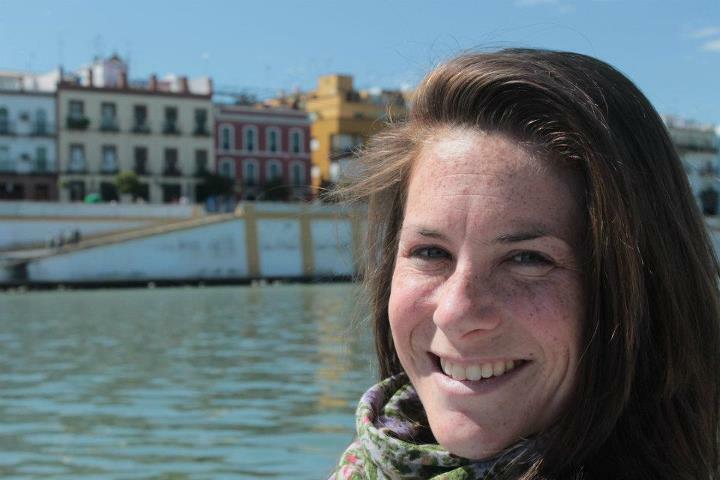 Orange trees and tiles rooftops covered the patios and living quarters, and that quick glimpse of her dandelion hair at the Feria was all I’d get until she died in late 2014 and I, along with thousands of others, attended her closed-casket wake. Even though I’d arrived a quarter hour early, the guard let me in, and I had a few moments in the inviting courtyard to breathe in the dew on the naranjo trees. 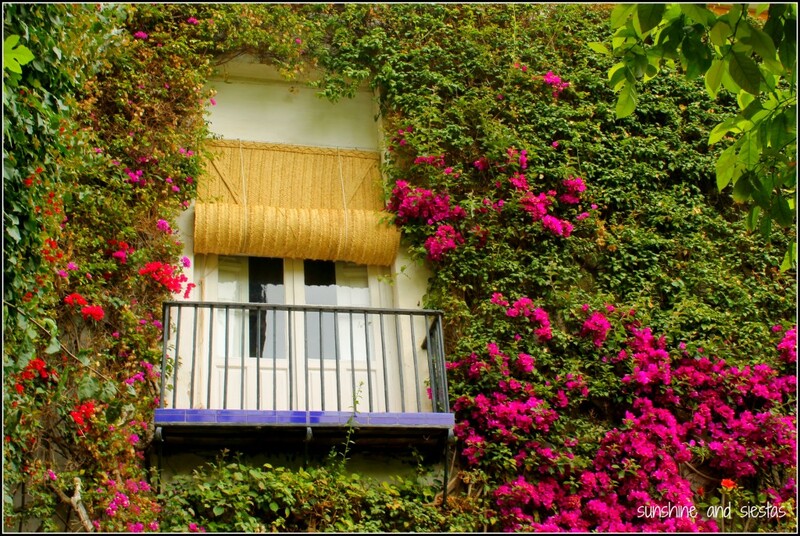 The ivy- and bougainvillea-covered façade was perhaps the most inviting part of the property, a landmark that’s seen dignitaries, foreign movie stars and the glamoratti sleep in its many bedrooms. 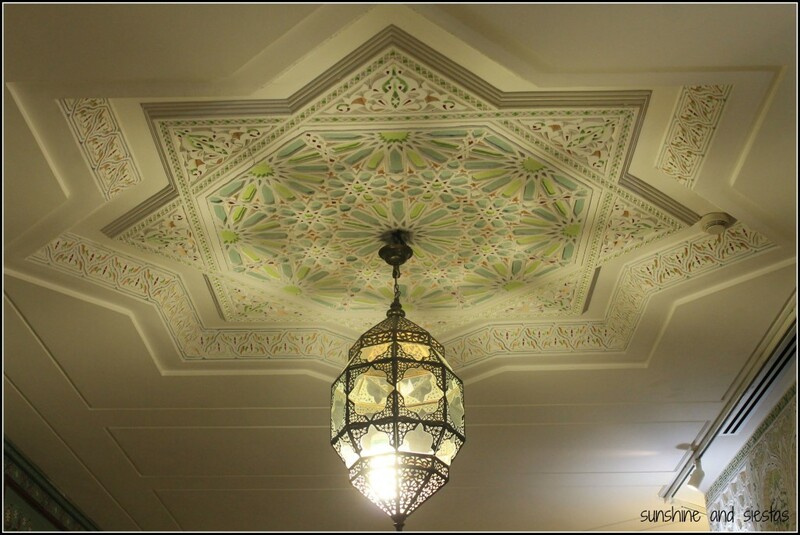 The 1,900 square meter property has long been closed to the public, save special events. And even with that much space, once the 11am entrance time hit, I was constantly being bumped into by old ladies or screeched at to move by the same old ladies. I lingered, letting them pass through to the inner gardens while I, like Cayetana, sought refuge in the stables (my mother would be proud). Considering horses and bullfighting to be two of her greatest passions, the Duquesa kept horses on her property and owned several carriages – not to mention the dozen or so private farms that belonged to her before she divvied them up preceding her third marriage. 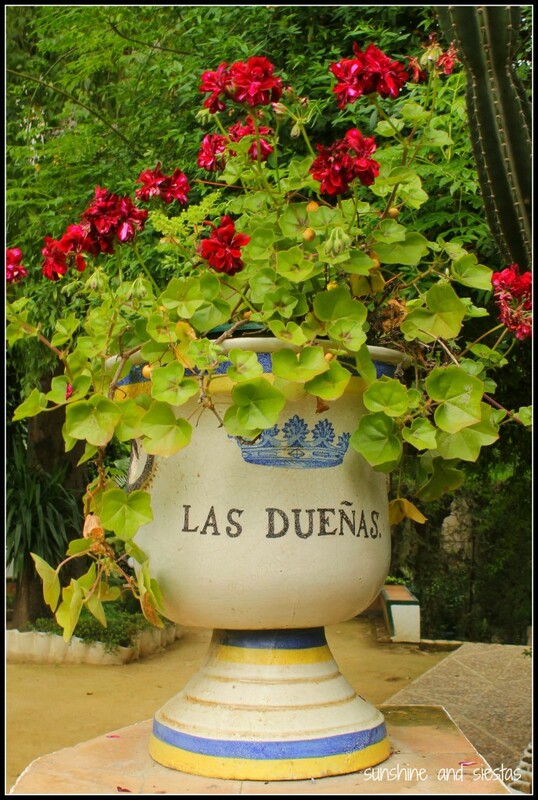 The humble stable opens up into a small, dense garden lined with tiled benches, pockmarked with fountains and reminiscent of other famous residents of Dueñas. 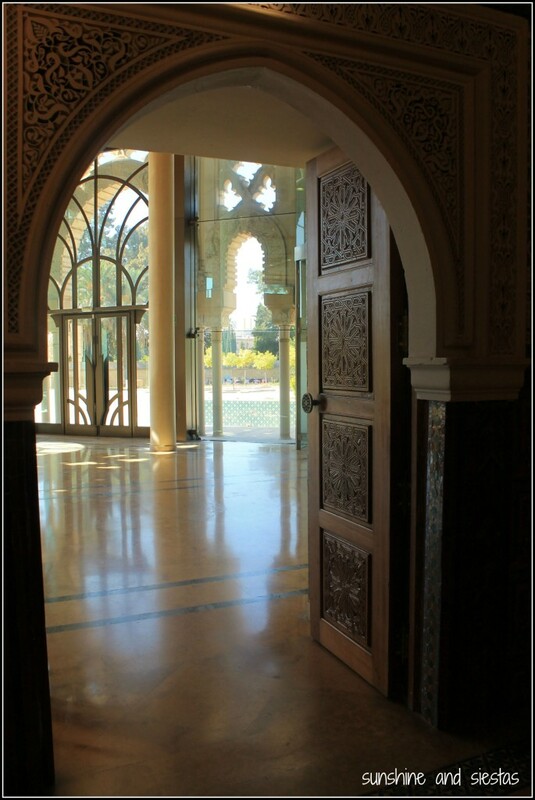 Framed by Arabic lattice work etched in marble, arches lead from the private garden into the main living quarters, themselves surrounding a breezy interior patio decked out with sculptures, tapestries and paintings. 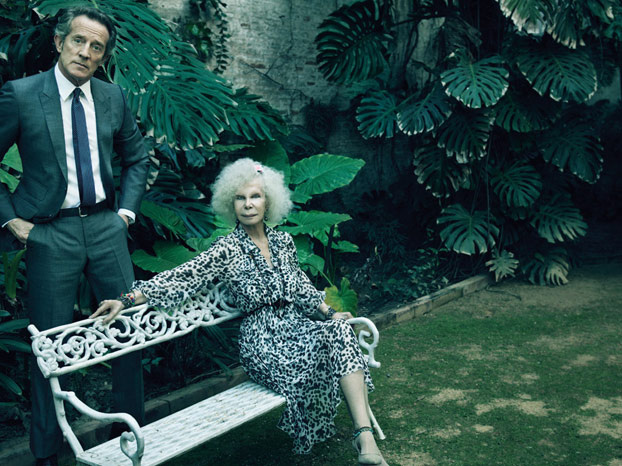 More than money in the bank, the Casa de Alba’s legacy lies in its numerous land holdings and priceless art collection, protected by the Fundación Casa de Alba. 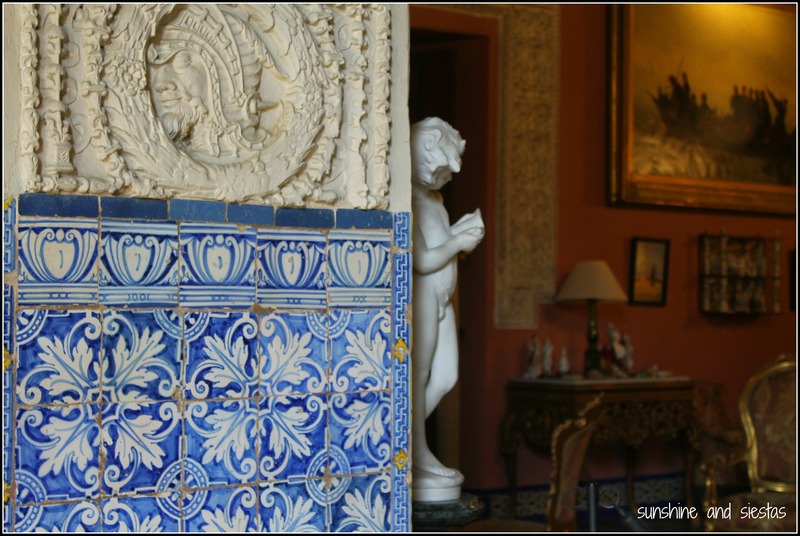 The tour leads guests through half a dozen rooms on the ground floor, a glimpse into how the Duquesa lived and a taste of her greatest aficiones evident in the decoration and her personal items. 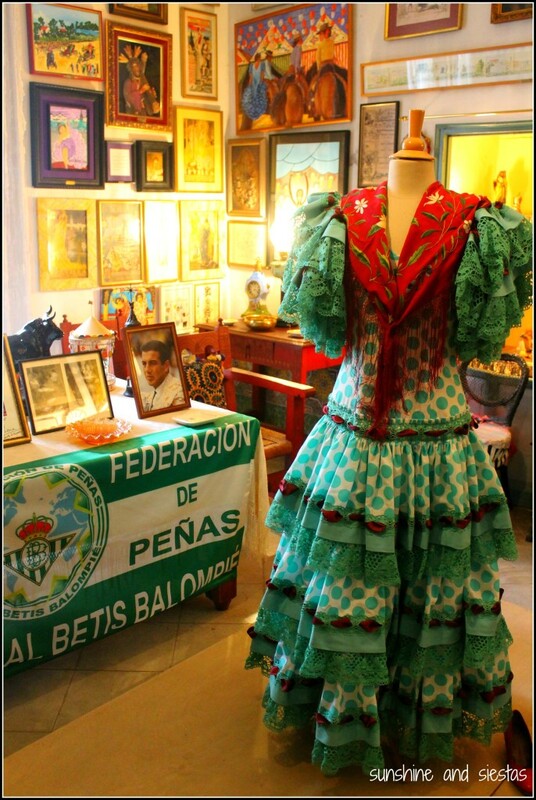 Betis flags, sketches, Spanish history books and old Fiestas de Primavera posters seemed to cover every inch of wall, statues scattered throughout great halls. The most curious item? A white zuchetto, enclosed in a glass case near the altar where Cayetana wed her third husband. 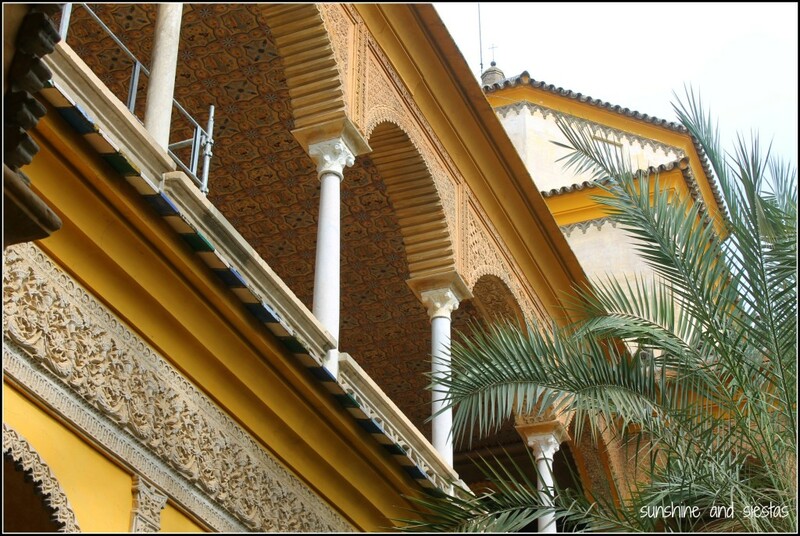 Like Cayetana, I know that Seville is a city that gets under your skin – it’s one of the hardest goodbyes I’ve ever had – and Dueñas celebrates her eccentricity and the beauty and cultural tradition of the city. 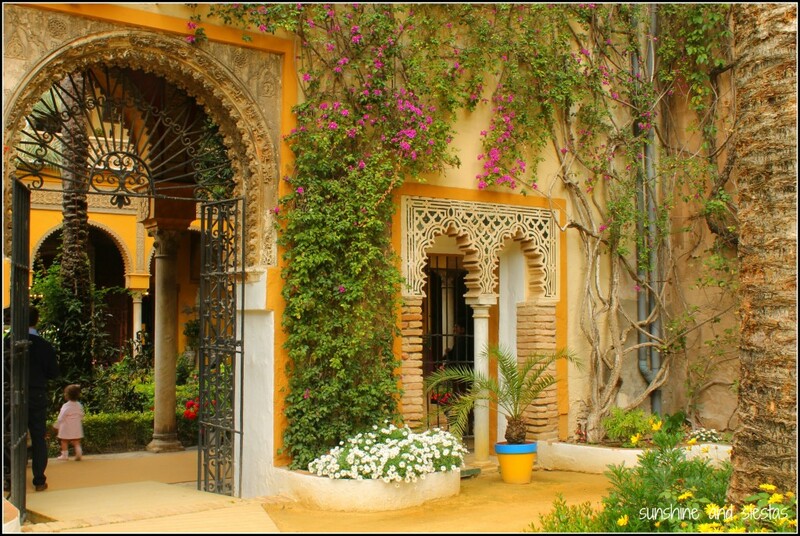 Like Sevilla, the house is timeless and at its most beautiful in the springtime. 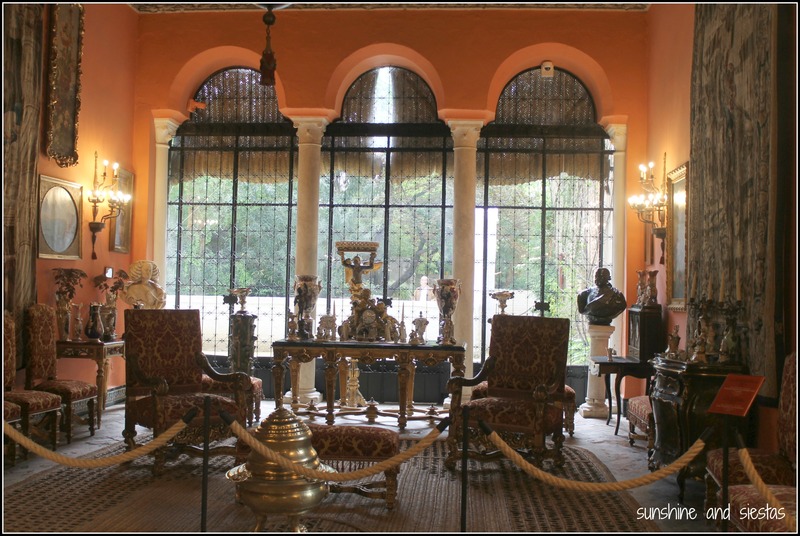 Seville has several beautiful casa-palacios open to the public – Casa Pilatos or Casa de la Condesa de Lebrija being standouts – but Palacio Las Dueñas seems to capture recent history in a way that the former miss. 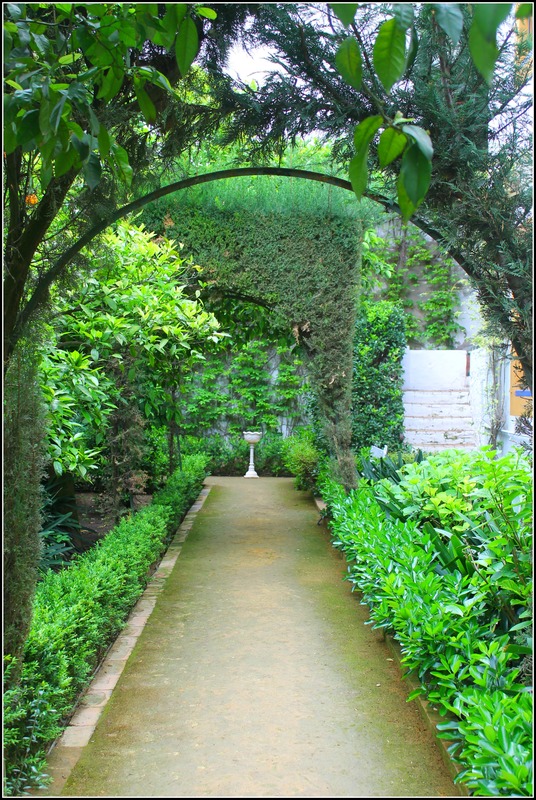 After passing through the grand vestibule, I paused in the Jardin de Santa Justa and looked at my watch. It was nearing 12:30, the perfect hour to hop across the street to Bar Las Dueñas, a humble tapas bar where Cayetana would have her daily cervecita. I toasted silently to Cayetana’s memory, her legacy and the sevillano sun beginning to break through the clouds. 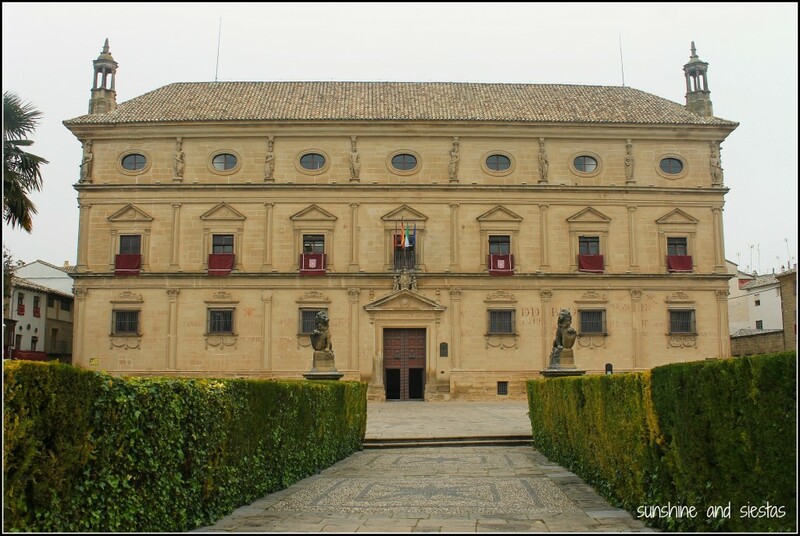 If you go: Rumor has it that the reason the palace has been opened to the public is strictly financial: the Duquesa’s heir couldn’t pay the taxes it. Regardless, it’s a fine example of sevillano architecture and a museum to one of the city’s most prominent figures in recent history. Dueñas is open to the public for self-guided tours for a price of 8€, closing only on Christmas Day, New Year’s Day and the Epiphany. Summer hours stretch from 10am until 8pm; the palace closes in the winter at 6pm. You can nab tickets at the gate (note that there’s a limited number available, and tickets have an hourly entrance time) or on ticketea. I opted for the audio guide, which cost 2€ after the entrance fee. 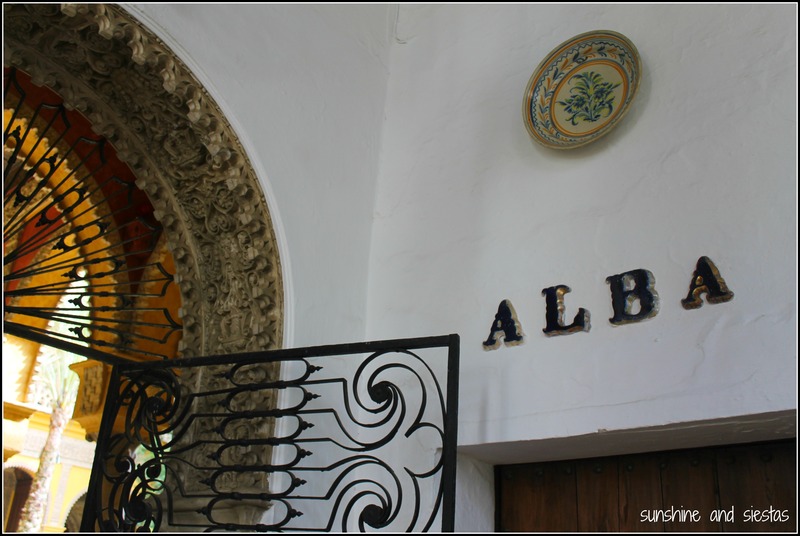 The guide not only gave me a solid understanding of the Alba family’s legacy, which stretches back four centuries, but also pointed out architectural and aesthetic details. This house has museum status, so spring for it! 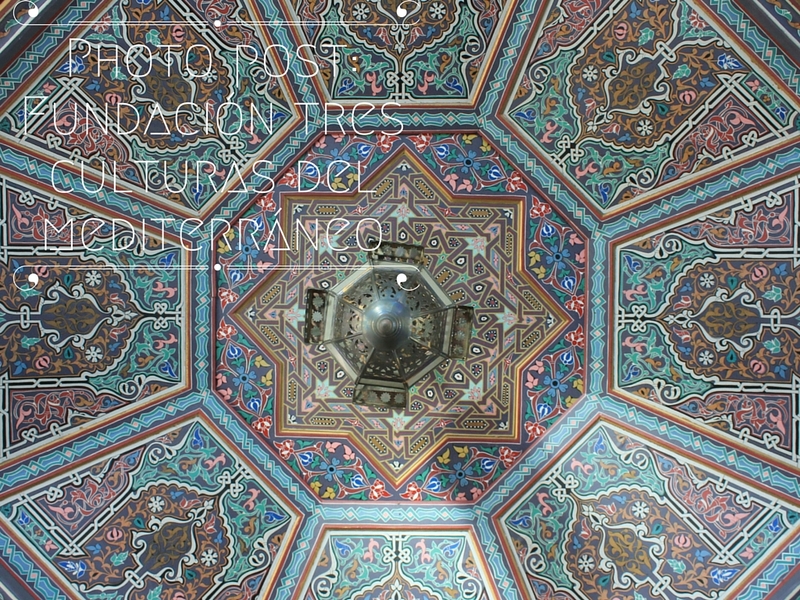 Have you been to the Palacio de las Dueñas or other state museums in Spain? Check out my posts on the Monastery of Yuste, where Emperor Carlos V went to die and the preserved medieval walls at Ávila. It was a night like any other: I was watching clips of America’s Next Top Model (shame, shame) when my Macbook Air screen when blank. It was a sign for me to go to bed, I presumed, so I clicked it shut and set it on my nightstand. The following morning, I heard the familiar cha-CHUUUUUN that my Mac cries when turning on, and even though the keys glowed, the Black Screen of Death stared at me. I remember sighing heavily before reaching for my phone for a homemade remedy, cursing myself for updating the system before. After a few uninspired attempts to reboot a perfectly healthy system that recently underwent surgery to make it faster and more secure, I relented and took it into the Mac repair shop in Los Remedios. Mr. Mac confirmed my fears: the cable that connects the screen to the keyboard was shot, probably from my long hours watching American TV series, mindlessly clicking on wikipedia articles and writing for SandS, COMO Consulting and other publications. And it was going to cost me at least 500€ to fix. OK Universe, I heard you loud and clear: My computer does not have to be my best friend. I had ideas for posts bursting out of my head, 89 unread blog posts from other sites I follow and several emails to get to, but I opted for a nap. A bonafide, not-binge-watching-Shonda-Rimes-dramas-and-calling-it-rest nap. Faced with an afternoon with not much to do and spending money reserved for rescuing my Mac, I was desperate to find an activity to do at home that didn’t involve a screen. I came up with cleaning, which I’d done two days prior or organizing my desk. 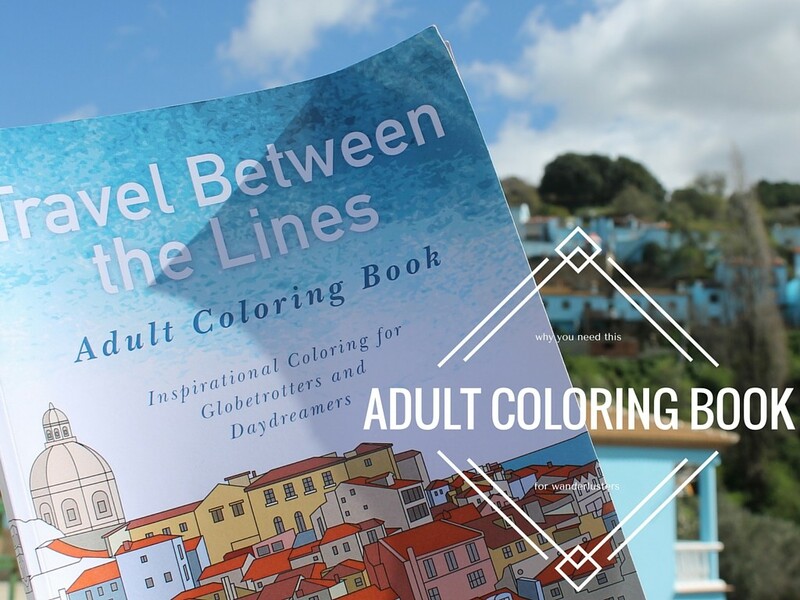 From under a stack of papers and lesson plans for the month, I unearthed Travel Between the Lines, and adult coloring book that my friend Geoff and Katie Matthews of Wandertooth Blog sent my way. I smiled – the cover features Lisbon, where I had recently traveled with my family. 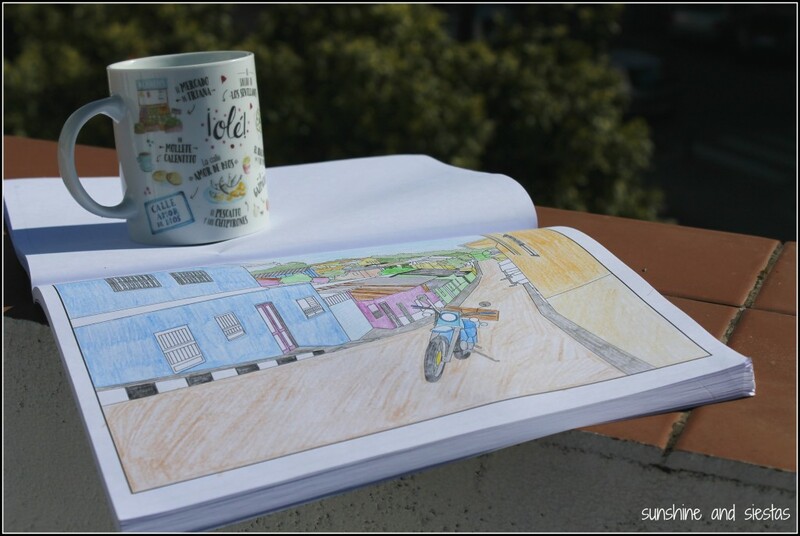 Digging out and sharpening my set of colored pencils, I turned on a podcast and set to work on the first photo I turned to: street scene of rural Barichara, Colombia on page 22. Three-quarters of an hour of shading, lining and sharpening later, I’d used bright colors to turn whitewashed Barichara – which could have easily been a town in the mountains of Spain – into a technicolor dream, complete with a shiny new motorcycle leaned against the wall of the home. For someone who daydreams about far-flung locales, I didn’t want Pinterest or the internet skewing with my creative juices on this project. Adult coloring books have made a splash recently for their stress-melting power. And as an early millennial with her heart still stuck in the 90s, I have to admit that I felt like a kid again, more concentrated on shading and what color to paint the roofs than my broken computer. Plus, I had something to do while chatting on the phone with my mom on Sundays or before bed that didn’t require another screen. I met Geoff for an early afternoon beer at a cervecería buried somewhere in Macarena. It was early, but anyone ho can match me for beers after Spanish class is a friend in my book. Studying at Sevilla Habla language school, Geoff was spending a few weeks in Seville and would soon be joined by his wife, Katie. The married Canadians had been traveling since 2009 full-time and have been to more than three dozen countries. And that’s where this book comes in. Katie is the wordsmith of Wandertooth and Geoff is the visual video storyteller, but there’s little need for words or moving pictures in this book: there are 47 black-and-white pictures of their travels from 29 countries. 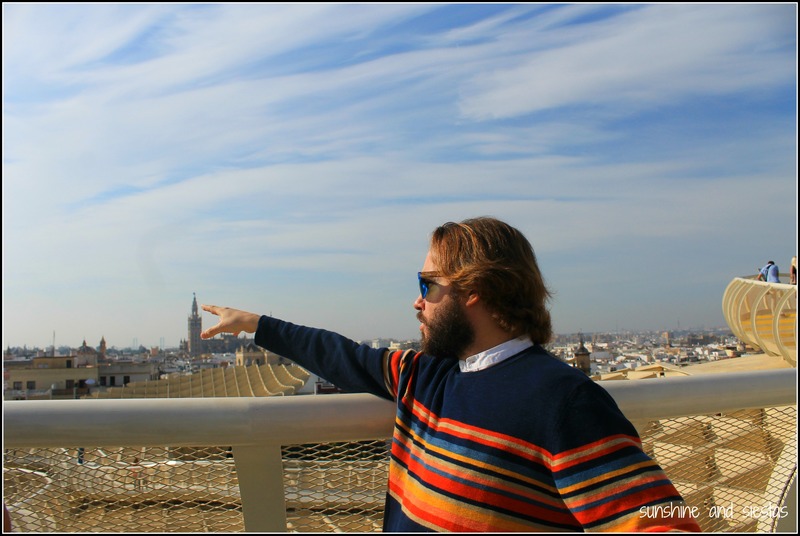 Flipping through, I recognized a few places – the effervescent Eiffel Tower of Paris, home to my childhood wanderlust; the chain bridge in Budapest, a city I fell hard for; the place of my expat nightmares, Plaza de España in Seville. But more often than not, I couldn’t tell if the pictures were Asia or Central America or Europe. When Wandertooth came up with the idea for Travel Between the Lines, they were already seasoned globetrotters who had lived around the world. 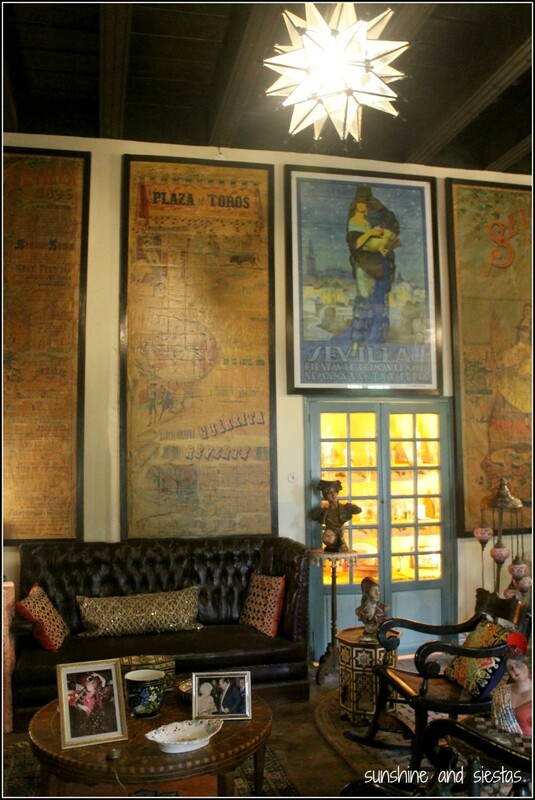 They sent their personal pictures to a designer, who in turn transformed them into art you could personalize. As travelers and part-time locals in many of these places, it’s like discovering a new place with a fresh set of eyes. Plus, they share two-line vignettes about their travels to each of the destinations featured at the back of the book. Geoff and Katie Matthews. Photo courtesy of Wandertooth. What’s more, some of the drawings are easy to finish (think attending high tea in London) whereas other offer more of a challenge – kind of like haggling at a souk in Morocco or wondering what exactly you’re eating at a street market in Taiwan. And by being 8.5″x11,” they can easily adorn your cubicle or cork board once you finish and rip them out. Think of it as a Color Me Mine for the clumsy or the minimalistic. Perhaps more important than fueling your wanderlust during your morning commute, Katie and Geoff are digital entrepreneurs and small business owners – even if their office has sand for a floor. Your purchase of the Travel Between the Lines helps them keep traveling, creating and running a digital empire. And, like every Canadian I’ve had the pleasure of meeting, they’re crazy personable and very nice! And they make excellent tapas crawlers. So while those 500€ to fix my Mac ended up being 189€ (and thus a plane ticket anywhere during Holy Week), a few minutes doodling and coloring is tiding me over. Want to Get Your Hands on the Book? Break out your colored pencils – and your phone camera! 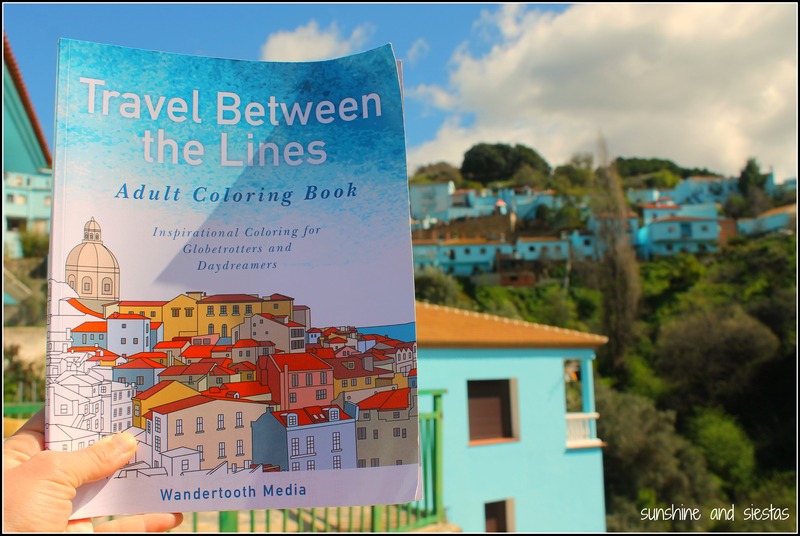 I’ve teamed up with Wandertooth to give you an adult coloring book – and I’ll send it anywhere in this big, wide world. 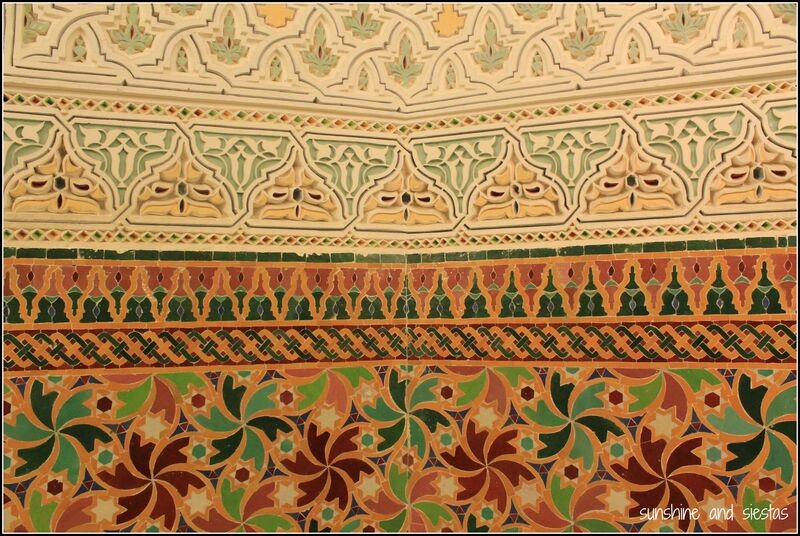 All you have to do is follow me on instagram and a tag up to five photos with a place you’d love to see featured in an adult coloring book with the tag #mytravelbtwnlines. Think exotic, spiritual, adrenaline-pumping…and anywhere in between! 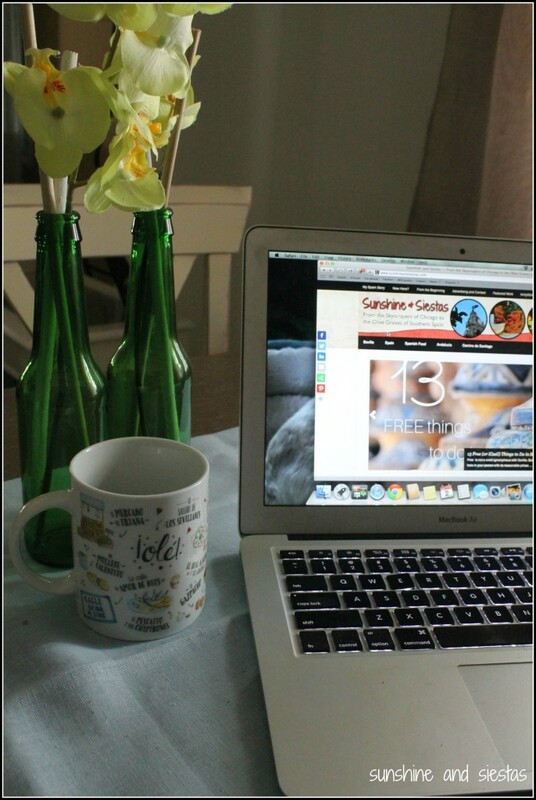 Or, you can tweet them to me at @sunshinesiestas with the hashtag #mytravelbtwnlines. Be sure to include the city and country it’s in and a quick description, along with your name and first initial so that I can contact you if we choose your photo. Contest runs until March 31st, after which the winner will be notified. Winner has until April 10th to claim their prize, lest another pinner take your prize! 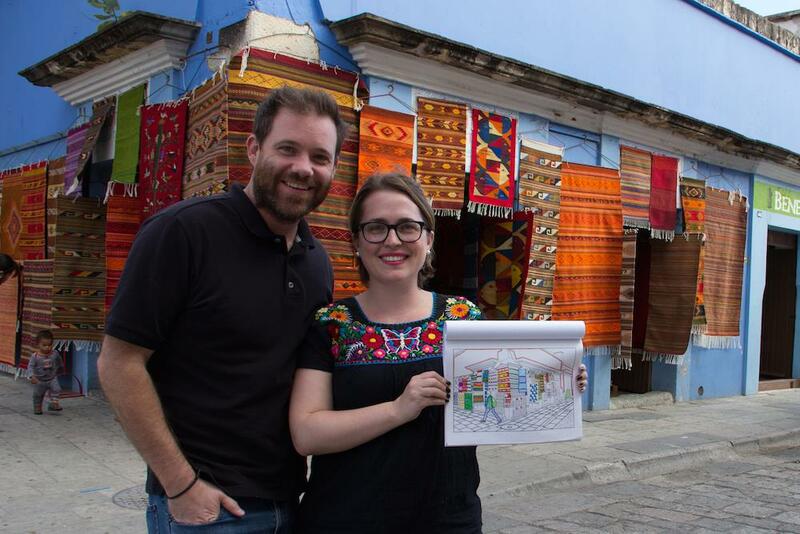 You can nab Travel Between the Lines: Inspirational Coloring for Globetrotters and Daydreamers on Amazon, or enter this contest for a free copy, courtesy of Geoff and Katie. And – psst! – another book is on the way! You might even see my hand wrapped around a cervecita on a warm March day featured! 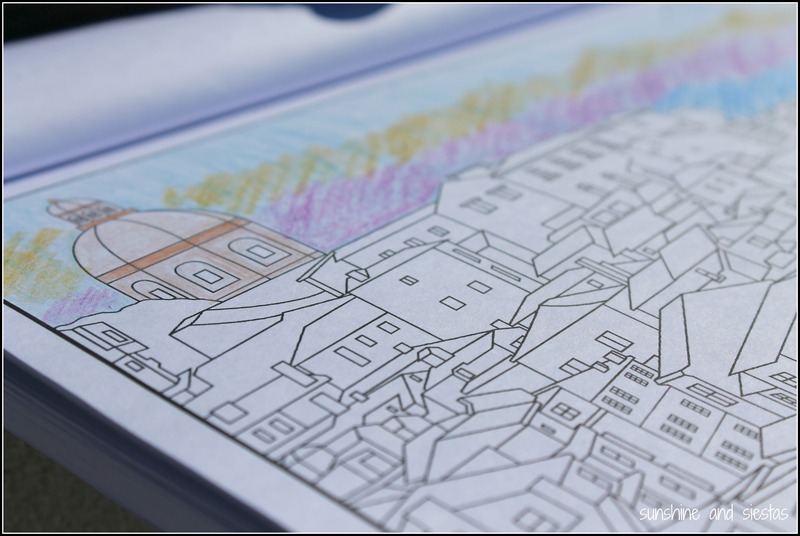 Have you ever bought an adult coloring book? “I’ll just stop talking before I ruin the Feria de Sevilla for you,” Dan remarked, noticing that I’d stuck my fingers in my ears. A history and archaeology professor at one of the city’s universities, he’d already struck down a number of things I’d known to be true about my adopted city. 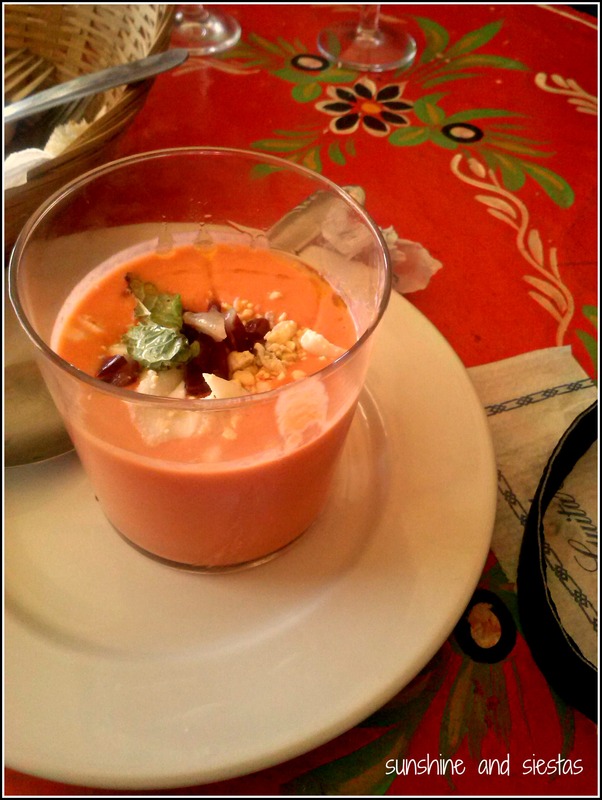 Dishes with a legend are rife in Spain, and Seville’s claims to gazpacho are just as common. Gazpacho is a cold, tomato-based soup that pops up on menus as both a dish and a garnish. It’s also about the only Spanish dish I’ve mastered. While the word gazpacho is of Arabic origin, and they commonly ate a dish of bread, garlic and olive oil, the dish as we know it today is definitely is not of Moorish invention. 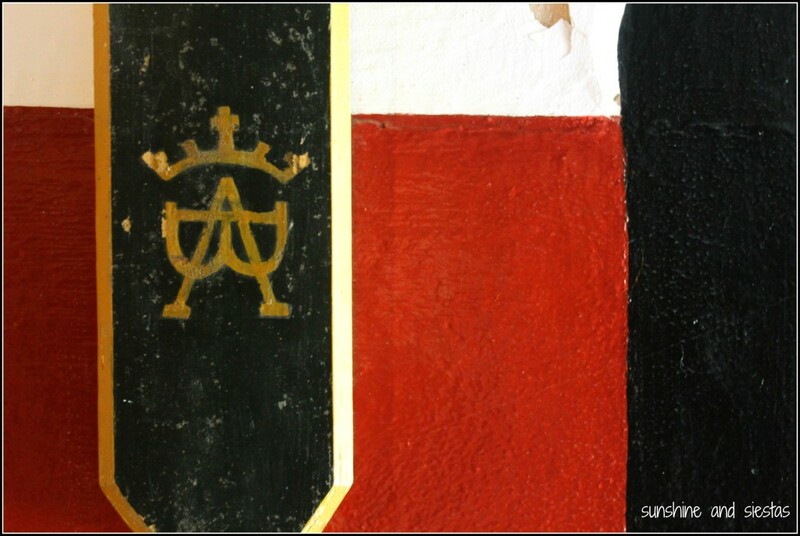 It a simple question of history: The Moors conquered the Iberian Penninsula over centuries, beginning in 711. The last were expelled in 1492 from Granada, the same year that the Catholic Kings sent a young dreamer, Christopher Columbus, to find a passage to India. Tomatoes come from the Americas, so the very earliest they would have appeared in Spain was the late 15th Century. While Moors lingered in Spain for centuries, the introduction of vinegar, tomatoes and cucumber would come much later. Columbus may have been onto something else: for all of the boasting I do about how perfect Seville is for biking and walking, the city was built in Roman times around a series of hills. 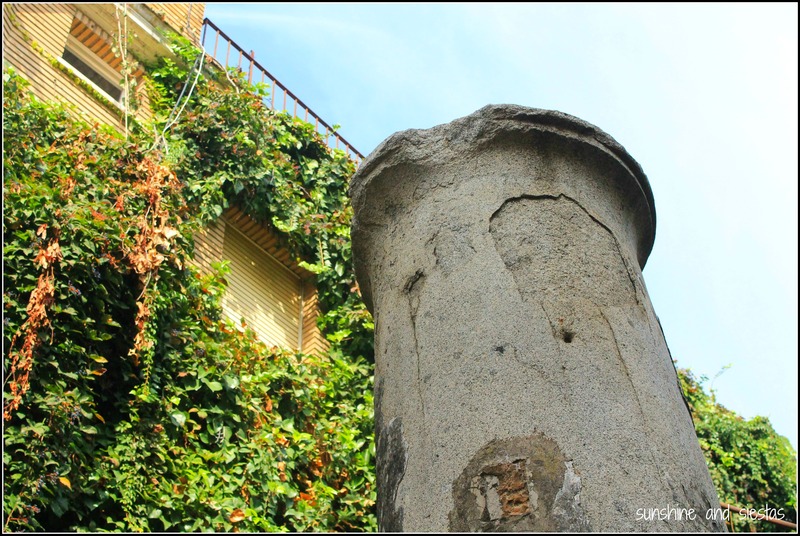 Little remains of the Roman past within the city limits, save a few columns on Calle Mármoles, the crumbling aqueduct that once carried water from Carmona, and the recovered mosaics and fish paste factory in the Antiquarium underneath Plaza de la Encarnación. 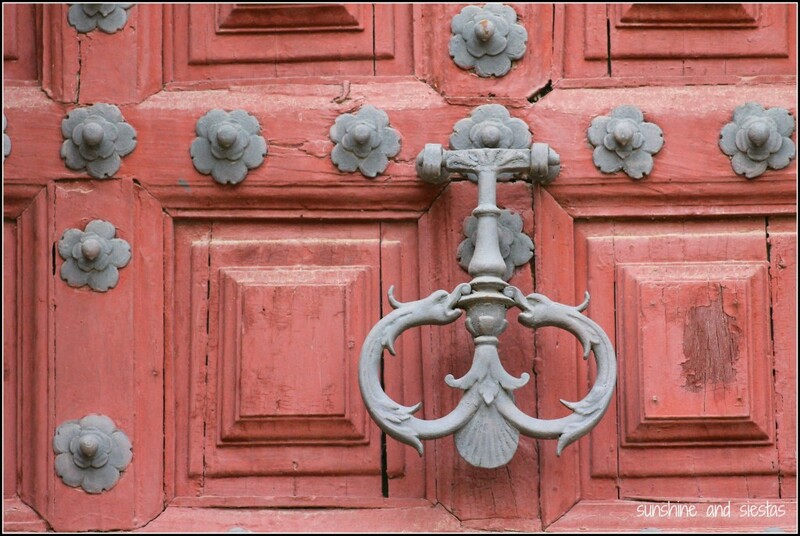 If you want to see ruins, head to nearby Itálica or Carmona, or even two hours north to Mérida. Roman Seville – then called Hispalis – had five major hills, with strategically built fortresses and temples built atop them. Laid out in a cross fashion, the major thoroughfares, called Cardus Maximus and Decumanus Maximus, and likened, to the main arteries of the human body, lead to a crossing near Plaza de la Alfalfa. This site was likely home to the forum, and Plaza del Salvador excavations have led archaeologists to believe the the curia and basilica once stood here. 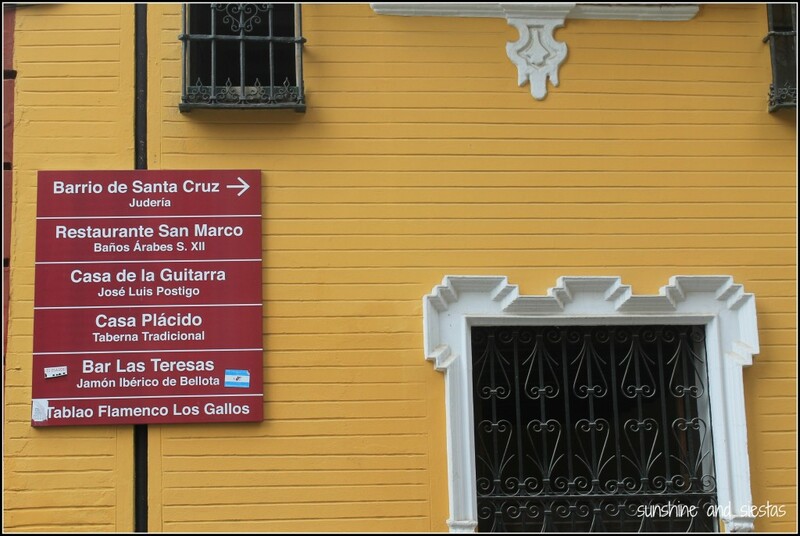 Indeed, the street leading from the east-west axis is the city’s one “hill,” dubbed Cuesta del Rosario, or Rosary Hill. My glutes would be better off having some changes in elevation, but my knees are glad that silt from the Atlantic, which once lapped shores near to the Cathedral and old city walls, filled in the shallow valleys. The streets of Seville are steeped in history, and many of their names give tourists a historical context. In my neighborhood, Calle Castilla stems out from the ruins of the Moorish castle, Calle Alfarería reveals where pottery and ceramic kilns once stood, and Rodrigo de Triana takes the name of the prodigal son who was reputedly the first to spot the New World from high in a crow’s nest. When Seville became a bustling commercial center after the Reconquist in the mid 13th Century, European merchants flocked from other ports of call to take part – population boomed, making Seville not only the most important city in Iberia, but also the largest in Europe. 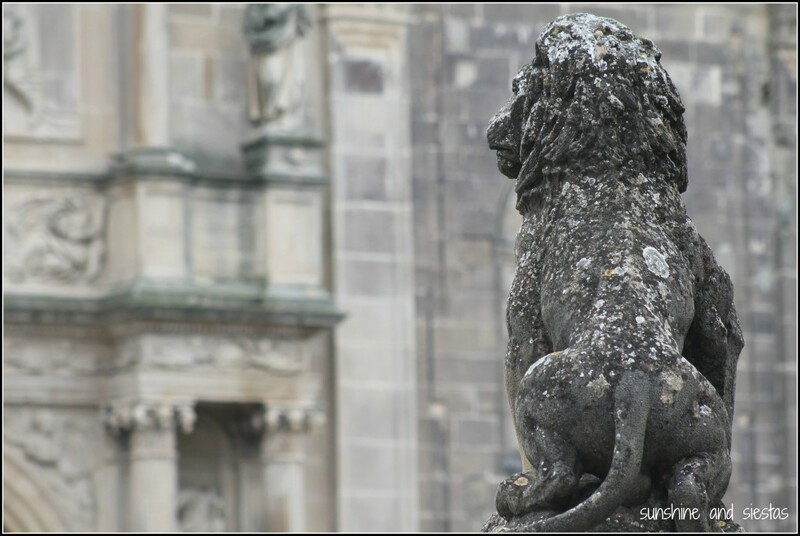 Dan explained that competition was fierce amongst bands of merchants, and large manor homes were constructed around the cathedral to showcase not only the wares – olive oil was big business, even then – but also wealth. 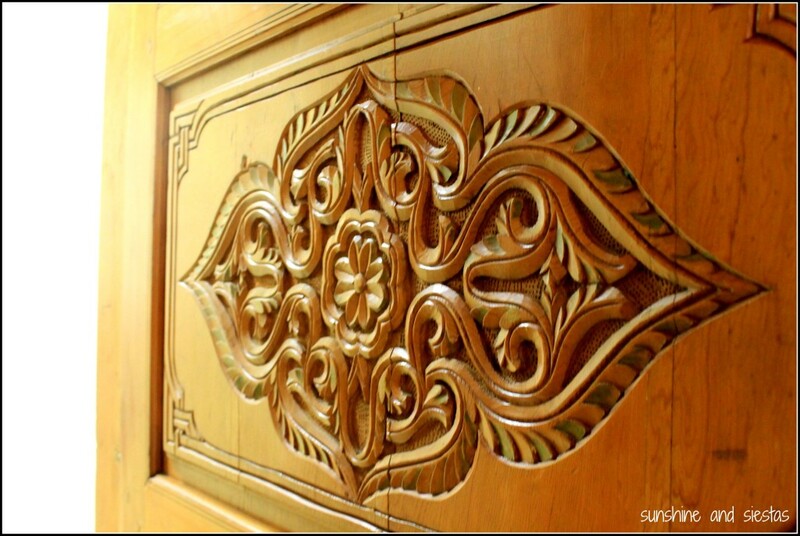 Just peak into any open doors in Santa Cruz, and you’ll see what I mean. Feudal relationships existed, and small gangs of street were established as territories, owned and operated by the merchant groups. Because of this, streets bear names like Alemanes (German) or Francos (French). The wealthiest group? The Genovese, whose market wares were sold on Avenida de la Constitución – the most important street in the city center. 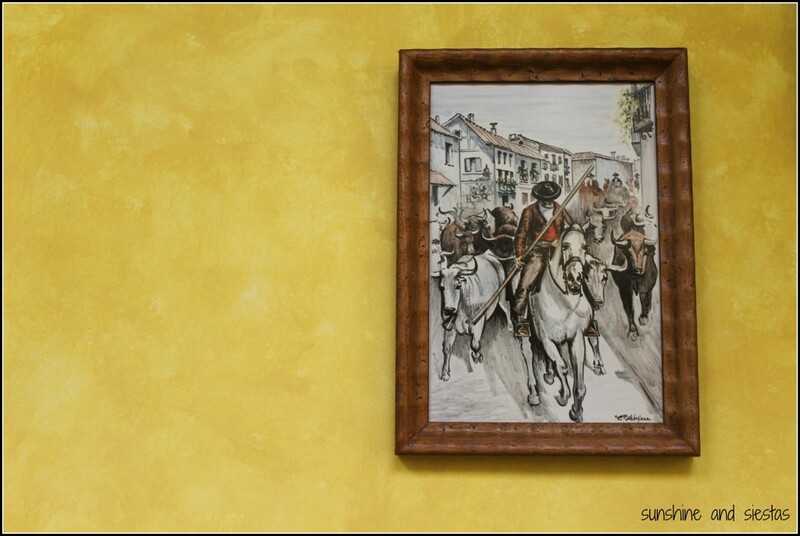 You may know another important genovés who passed through Seville during this time – he set off from Spain in 1492. 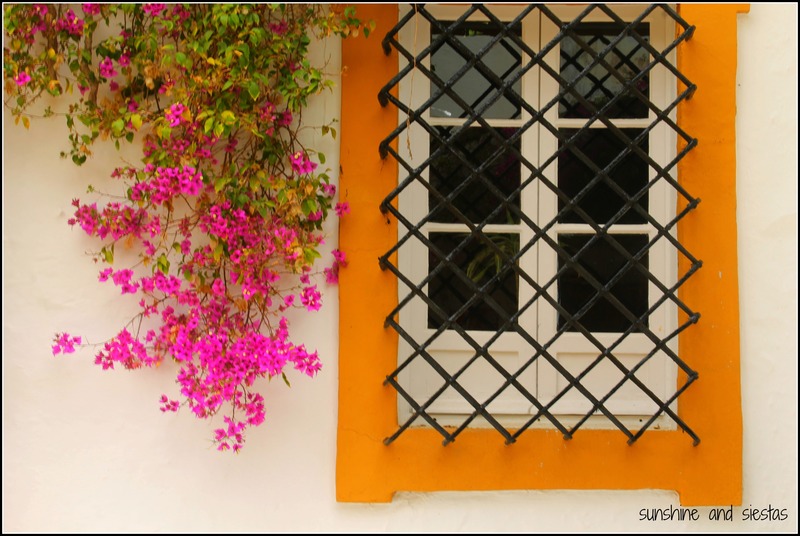 I was baffled – I’d spun tales about how my barrio had once housed seafarers, flamenco dancers and gypsies, and thus made it more colorful and authentic, an oasis untouched by tourist traps and souvenir shops. In reality, the heart of Triana – from the river west to Pagés del Corro, and from Plaza de Cubs to just north of San Jacinto – was encapsulated in high stone walls and a number of manor houses during the Al-Andalus period in the 10th Century. After the Christian Reconquist and subsequent destruction of the Castillo San Jorge, artisans, labor workers and sailors took up residence in Triana, perpetuating the stereotype that the neighborhood has been poor since its origins. Poor or not, it’s full of character and close to the city center, yet feels far away. 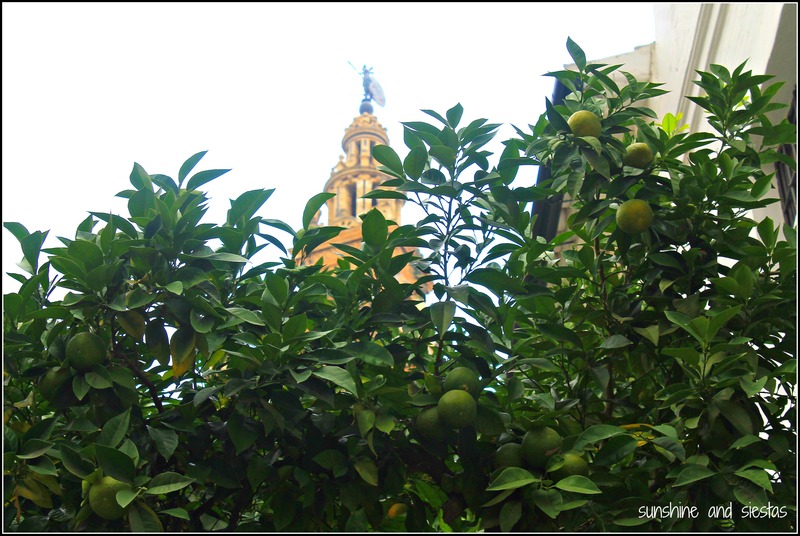 I had learned the importance of citrus fruits in Seville’s culinary history during a Devour Seville food tour, and had wrongfully assumed that orange trees had been around since the time of the Moors. After all, they brought their language, their spices and their architectural heritage, so surely they’d thought to plant orange trees. 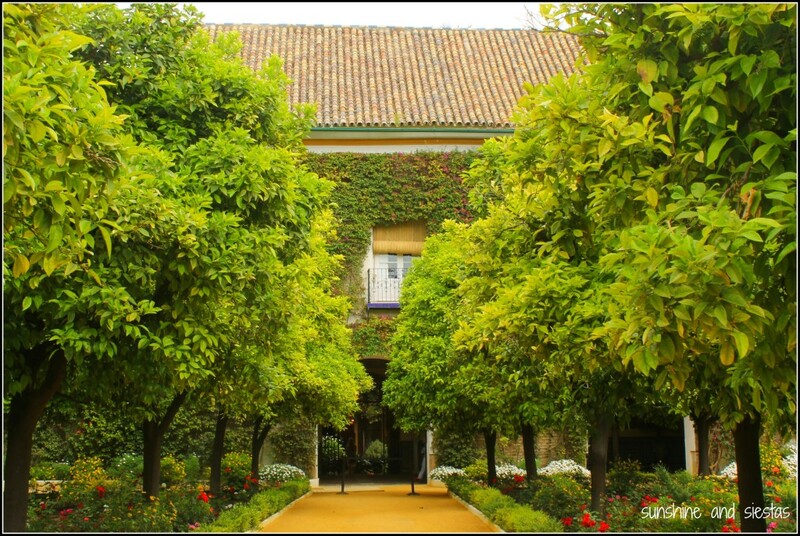 Maybe they did – the Monasterio de la Cartuja is said to have edible oranges, and the cathedral’s Arabic courtyard is named for the naranjos that populate it – but it was renowned Sevillian architect Aníbal González who suggested planting orange trees along roads and in private gardens. 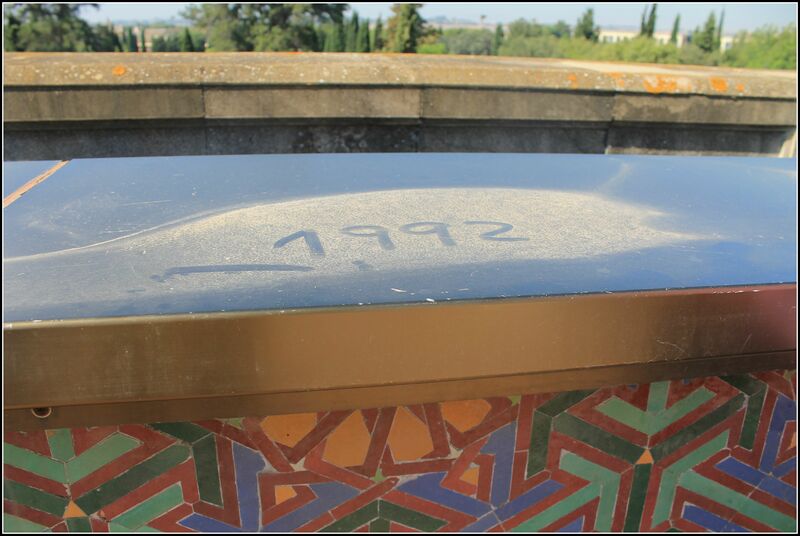 Hallmarks of the Neo-mudéjar visionary are littered around the city and other Andalusian cities, including his obra maestra, the half-moon Plaza de España. And Each year when the azahar blooms, I’ll be reminded that the Novio’s great grandparents wouldn’t have marked the start of springtime with their scent like I’ve come to do. I’d spill more, but the tour will reveal dark moments during the Inquisition, hidden secrets from the bustling commercial period after the Reconquist, and where the New World archives actually are – it’s a tour made for history buffs and visitors who want a more inside scoop on a city’s political, geographical and historical origins. Admittedly, many of these facts can be found online, but the point is that locals perpetuate the incorrect myths as a way to keep the magical of the city intact. 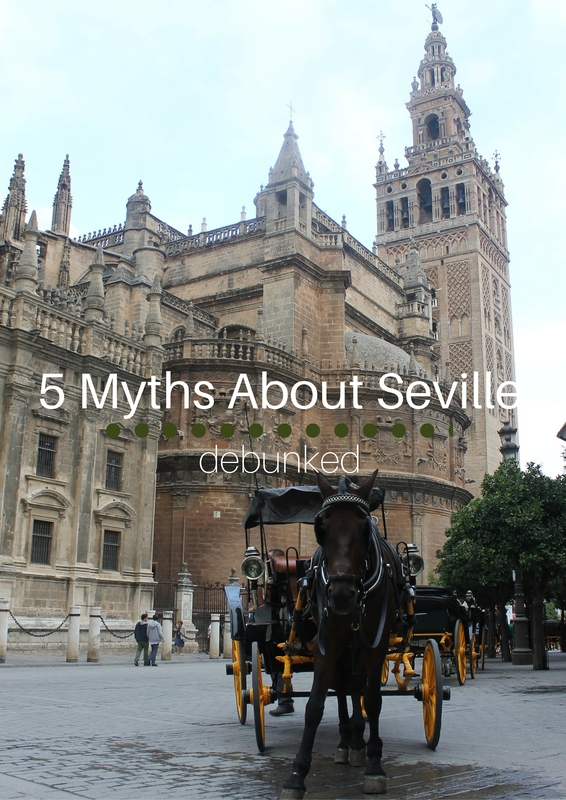 Sevillanos exaggerate, and these many of these tales are as tall as the Giralda itself. Dan and I walked back over the Puente San Telmo towards Triana, and I offered to buy him a beer back in the barrio (even though he tells me I’m from the cutre part). One Seville myth that will never die: cerveza is cheap and aplenty in this city, and tastes best on a sunny day with friends. Context Travel graciously invited me on the Seville Andalusian Metropolis tour free of charge; tickets are 80€ each ($91 USD at publishing), plus any entrance fees you may incur. Tourists are encouraged to tell the guide what things they’d like to see and explore to help give the tour shape – their tagline is #traveldeeper, after all! You can also look for them in Europe, North America, Asia and South America. Are there any odd myths in the city where you live? 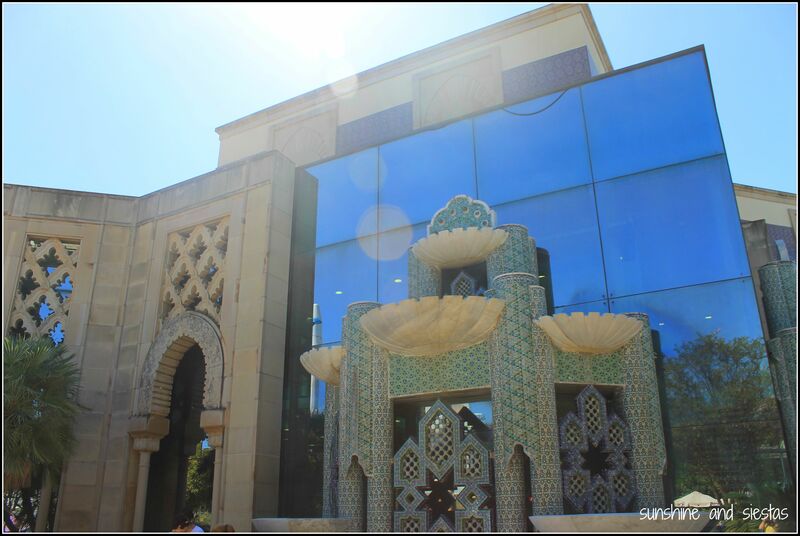 The legacy of the 1992 World Expo has certainly left its mark on Seville – the high speed AVE train was inaugurated to bring visitors to the Andalusian capital and, along with it, loads of tourist dollars. For six months, millions of patrons streamed through Isla de la Cartuja, a sliver of land between the Guadalquivir and the canal and into over 100 country-represented pavilions and themes. I could see the remnants of many of those buildings 25 years after the doors shut when I moved to Seville, and most had since fallen into disrepair or repurposed as government buildings. I’d often use the empty space to run, dodging weeds and broken glass on uneven pavement. I’d been past the Pabellón countless times, intrigued by a seemingly new building free of overgrown weeds and graffiti. 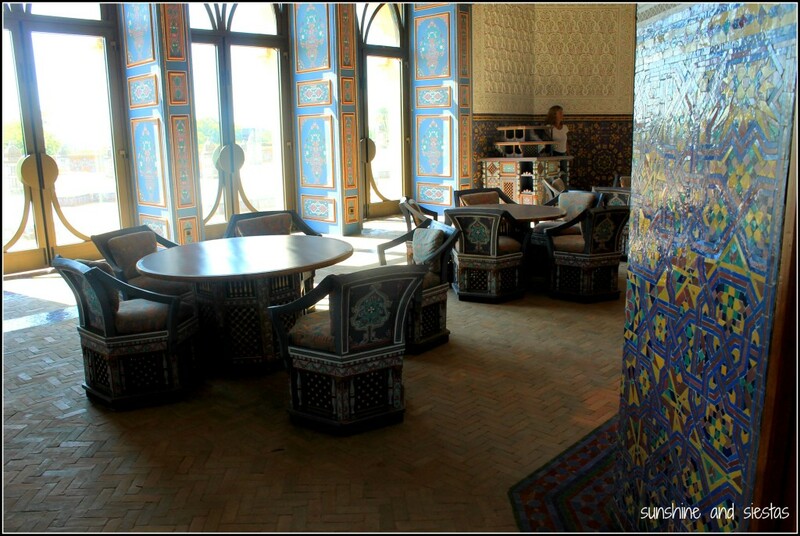 Thanks to a tweet, the occupants of the building, Fundación Tres Culturas del Mediterráneo, invited me to a free guided tour. I arrived by bike as Toñi was beginning the tour at the building’s exterior. 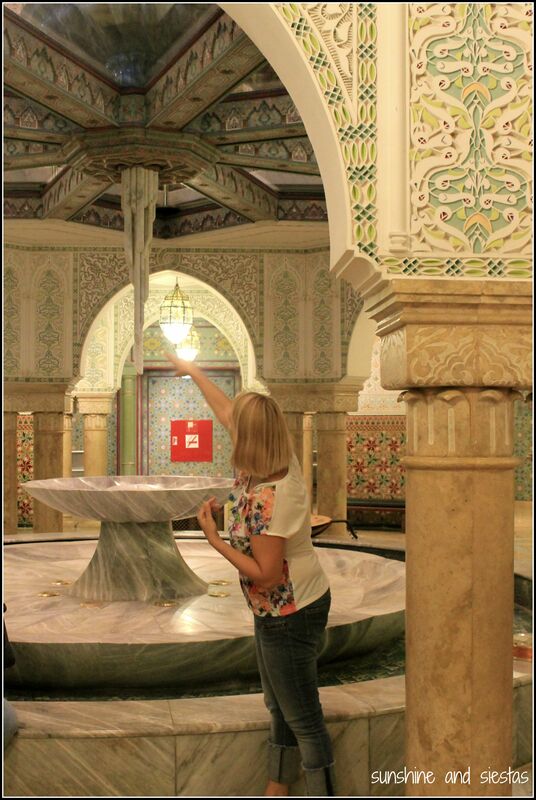 Based on an eight-point star, and shaped as thus I was amazed at the inclusion of so many hallmarks of Arabic, Mudéjar and Islamaic architecture, from the arches that led into the atrium to the outdoor fountain that once pumped gallons of water through the space. 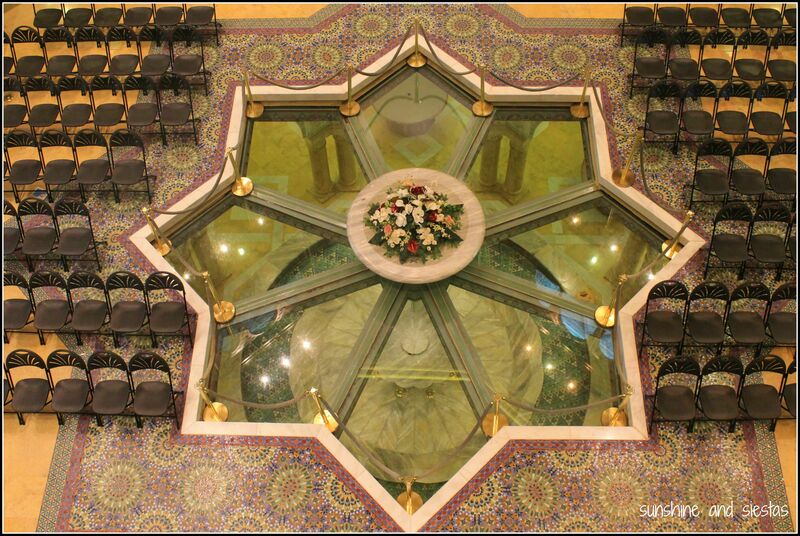 The striking glass wall is meant to represent Morocco’s entrance into the 21st Century. 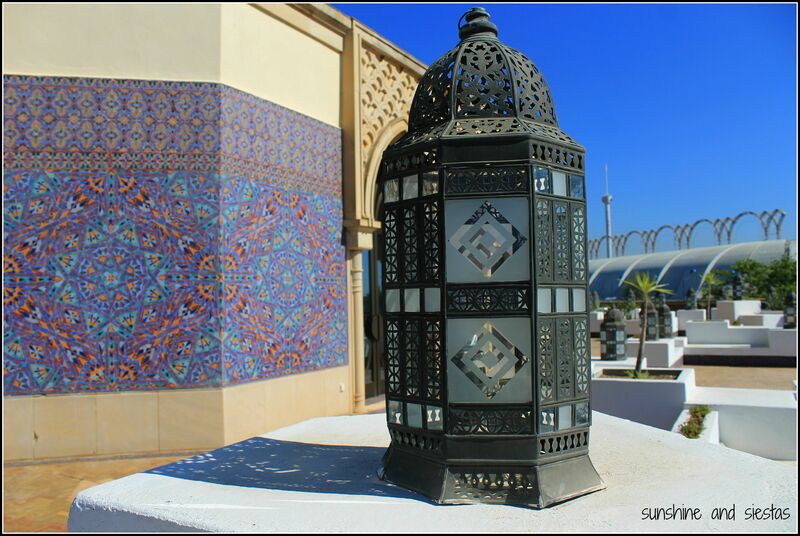 All of the work on the pavilion was designed and overseen by Hassan II, and the extensive artwork inside mirrors traditional procedures – including the eggshell plaster in the basement! 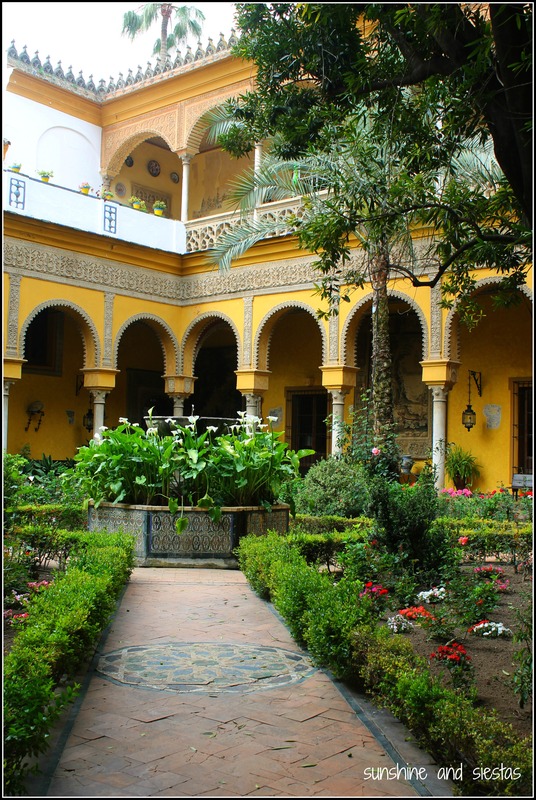 While the nearby Alcázar palace is a lesson in grandeur, the Morocco Pavilion feels refreshingly modern while tipping its hat to an extensive cultural heritage (plus, patrons are encouraged to touch everything!). 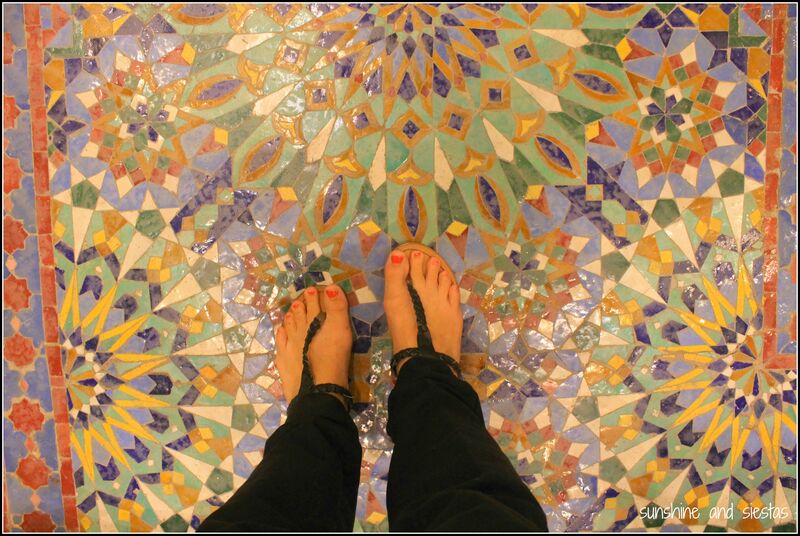 From wood to plaster to tile, I wandered from room to room flabbergasted at the symbolism and beauty of every room. The visit begins in the lower level, “an oasis” as Tonñi explains, going as far as pointing out that there are palm trees carved into the support pillars, just like in a desert oasis. With soft colors and devoid of mentions of idols or gods, the central fountain is surrounded by wood and plaster reliefs. The sumptuous main hall gets all of the glory – this is where conferences, concerts and even fashion shows are held – but the underground room is calming and striking. I asked my boss that afternoon if she’d gone to the Expo when she was younger. “Why yes!” she said, eyes lit as she slammed an open palm on my desk. “I was a tour guide – microphone and all! 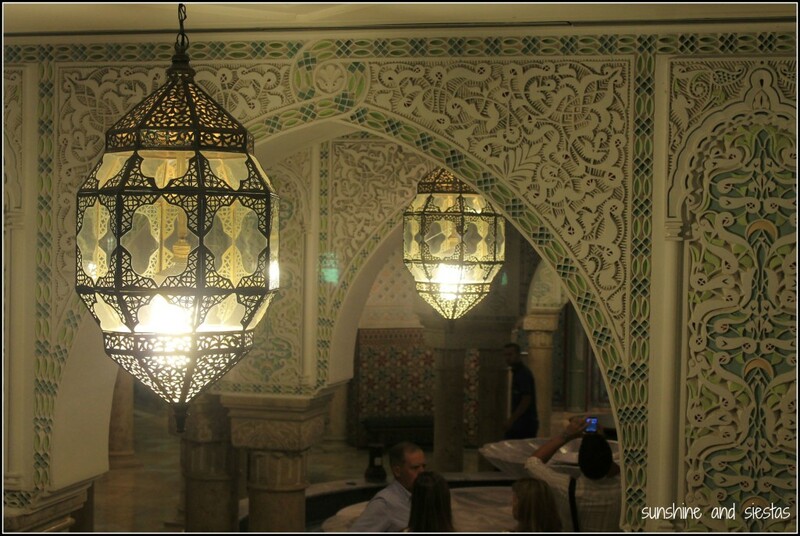 – and got to go to all of the pavillions!” When I mentioned I’d been in Morocco’s earlier than day, she through her head back and waxed poetic about the fluffy couscous that was served on the third floor’s exclusive restaurant. To me, the Fundación Tres Culturas bridged more than the past and the future – it bridges cultures and understanding. 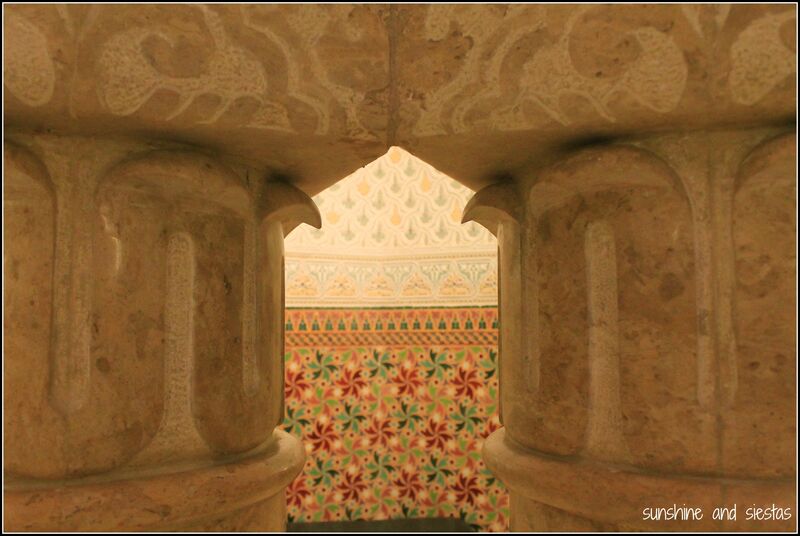 The Alcázar, the Mezquita and the Alhambra appear dormant compared with a breathing organism dedicated to preserving Spain’s three historic cultures. The Fundación de las Tres Culturas del Mediterráneo is open daily to members, with free guided tours being given on Tuesday mornings at 11am through their online booking system. 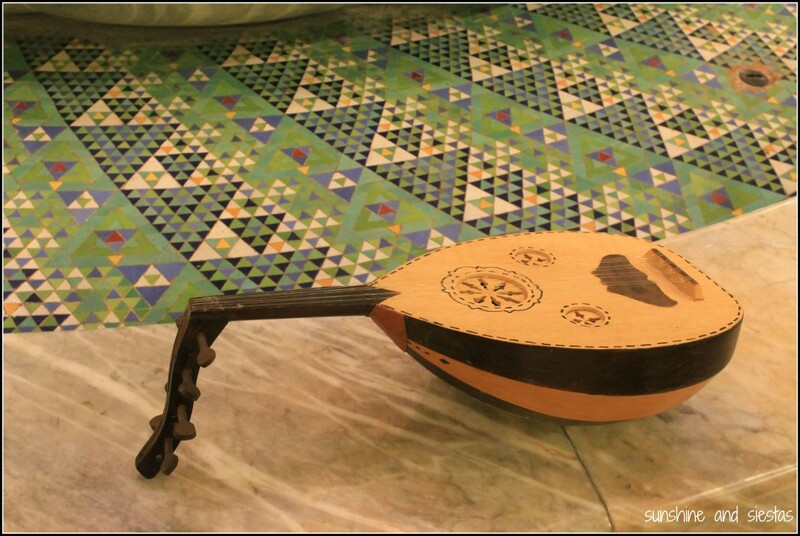 Concerts, Arabic and Hebrew classes and conferences are among their other cultural offerings, and they boast an extensive library with free membership. This coming Wednesday and Thursday, the Fundación Tres Culturas will be hosting a benefit event for Syrian refugees. 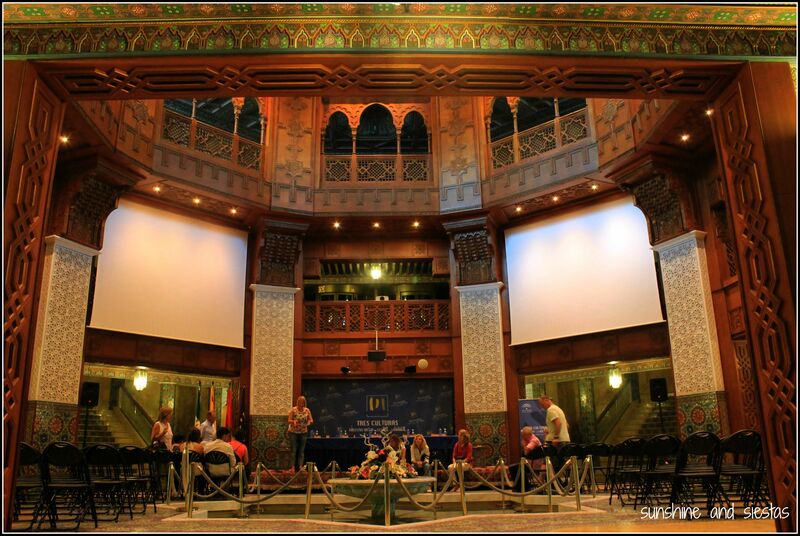 Listen to Syrian music and watch whirling dervishes in the main hall of the Fundación. Tickets are 10€ and 100% of the proceeds go to the Centro Española de Atención al Refugiado in their effort to aid refugees. For more information and tickets, check their page. 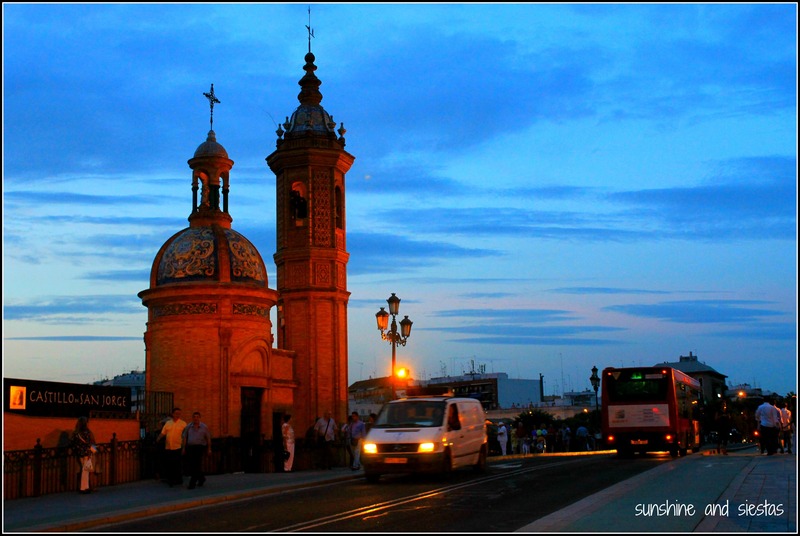 They’ll also be participating in Friday’s Noche en Blanco Sevilla, providing free evening tours until the wee hours.